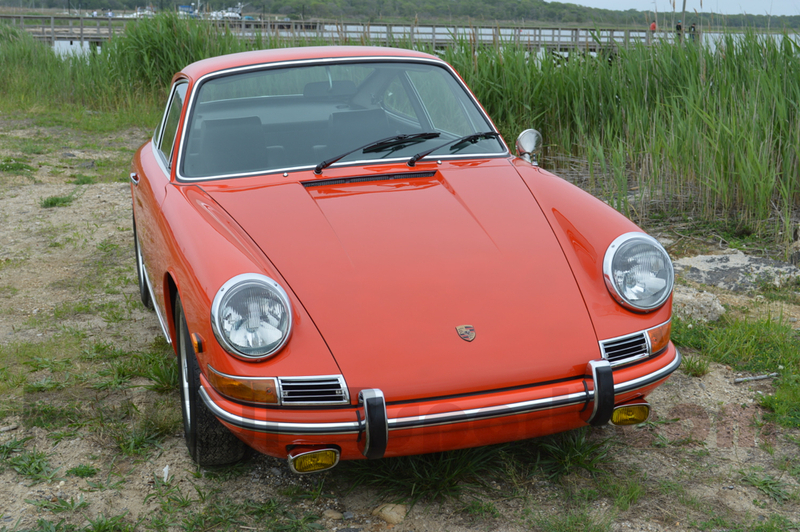 This is an original, unrestored short wheel base survivor. 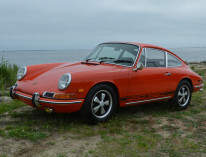 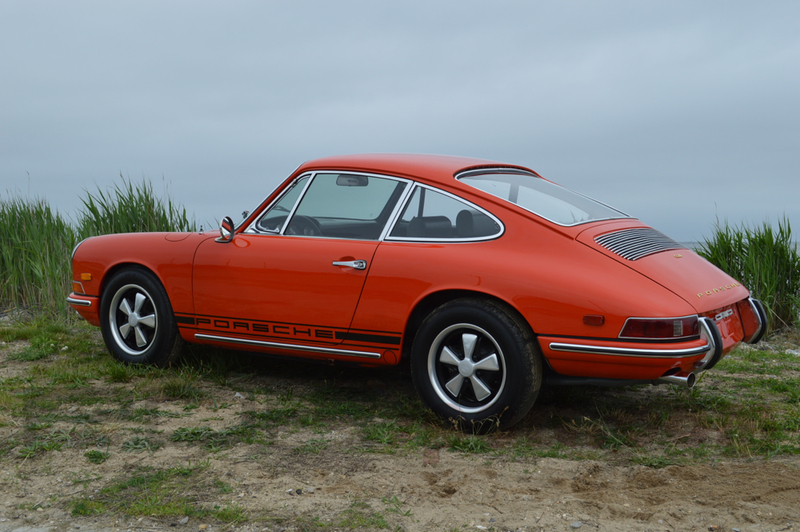 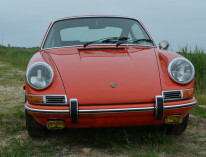 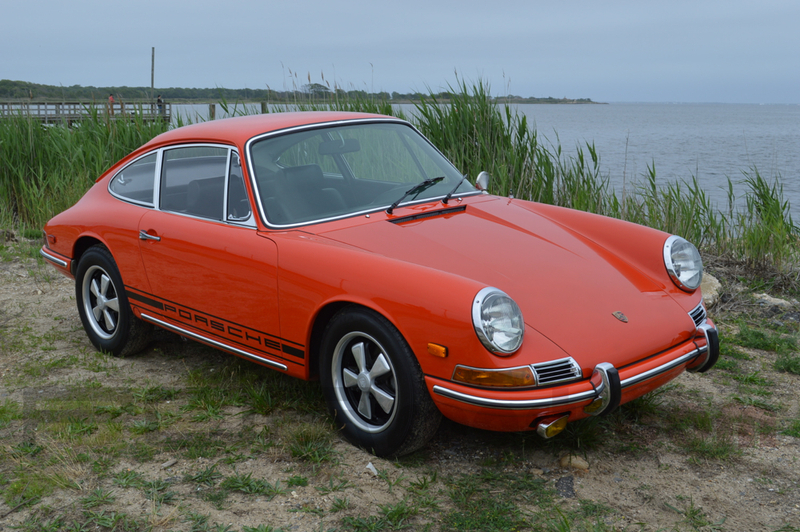 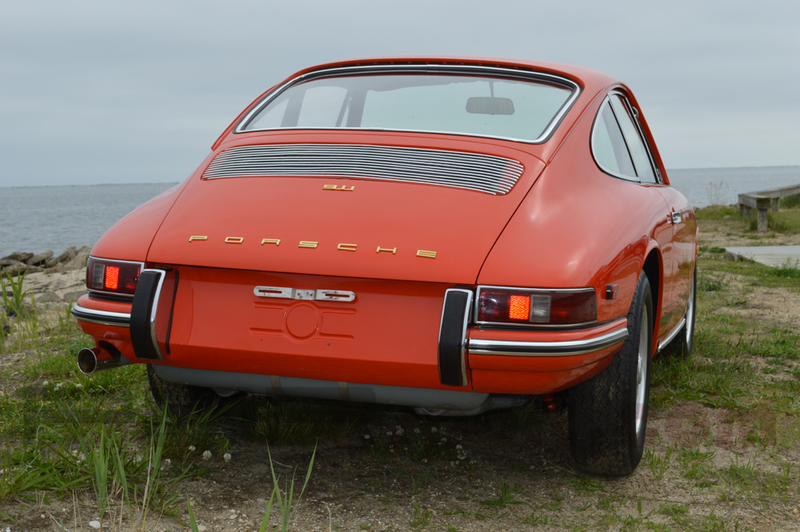 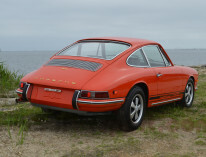 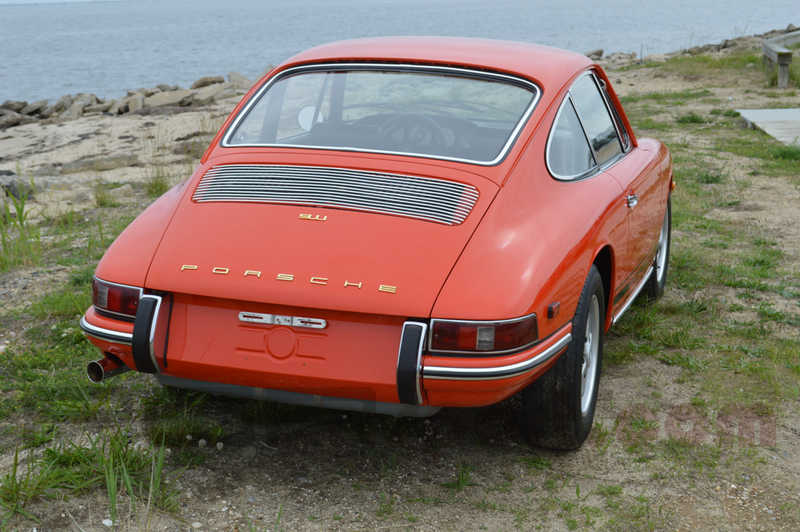 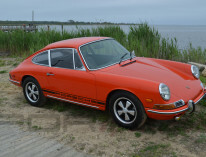 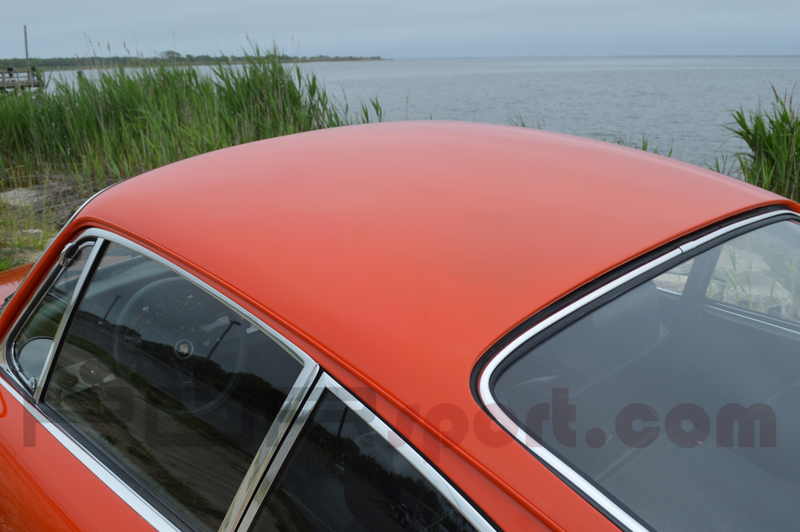 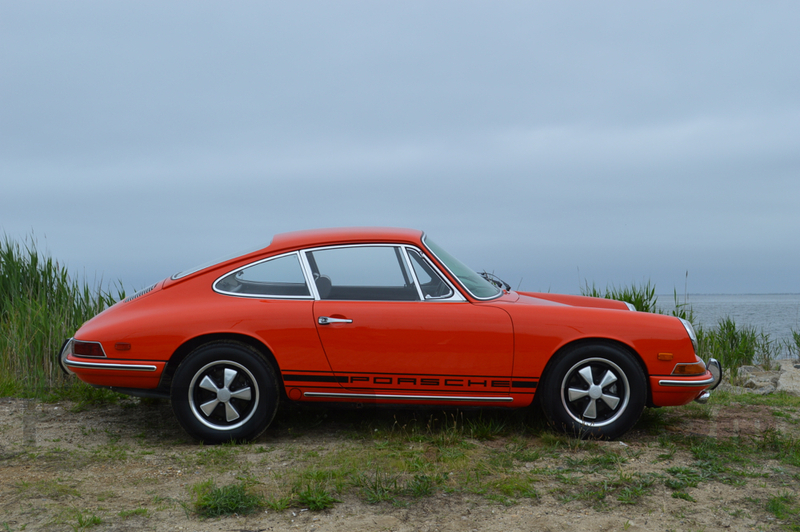 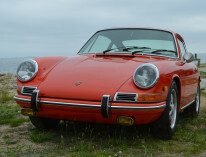 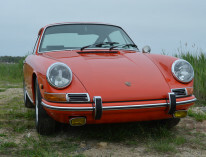 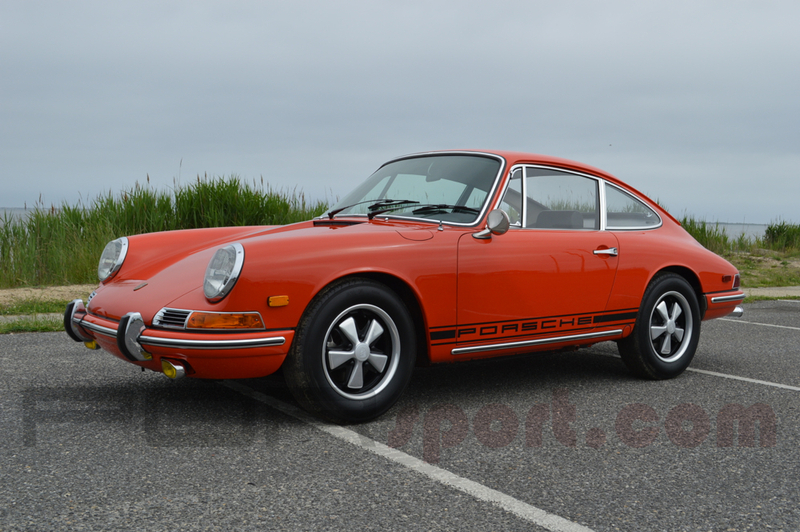 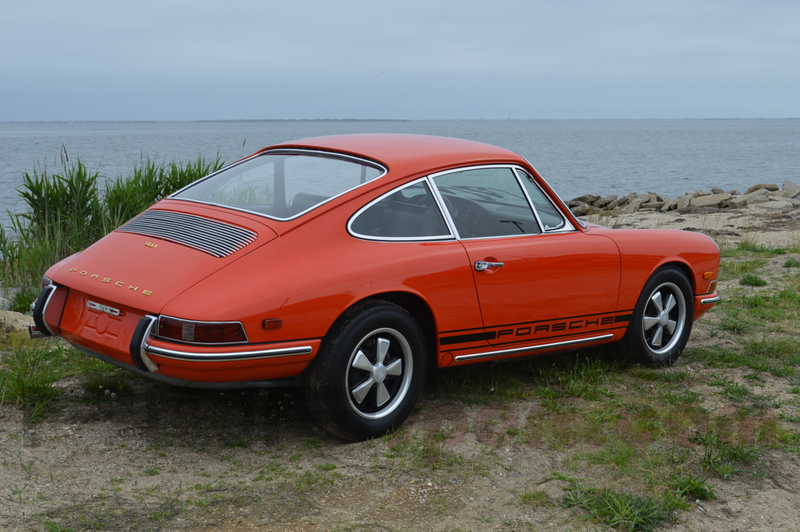 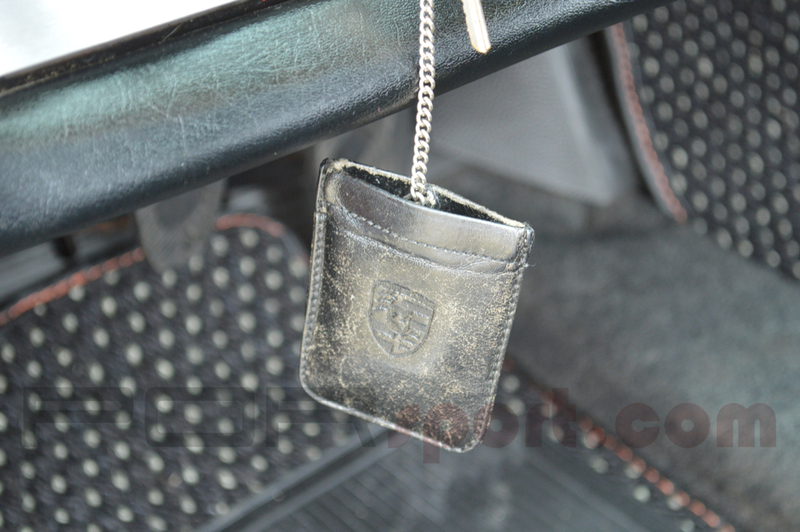 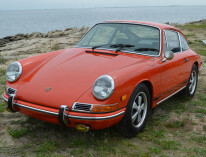 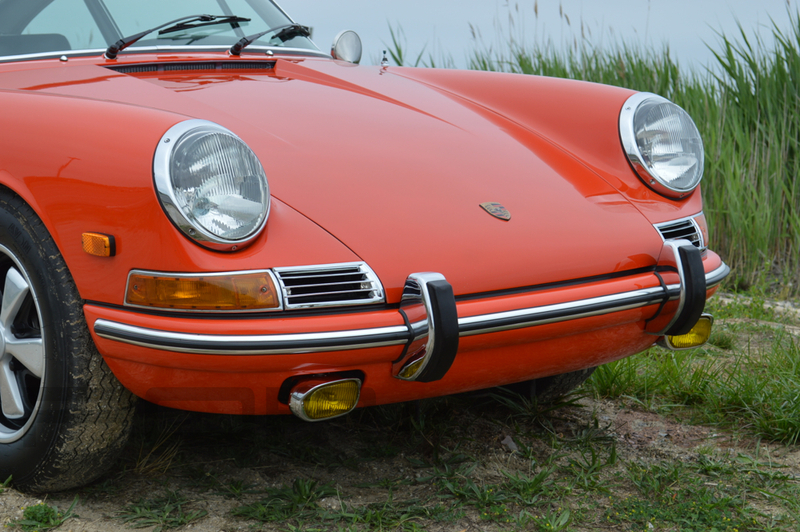 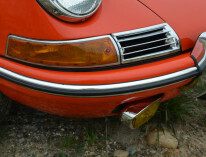 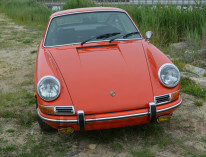 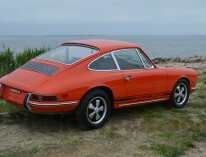 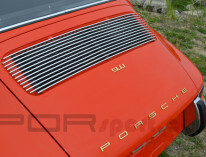 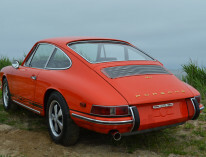 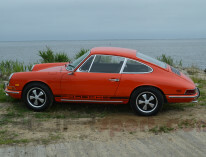 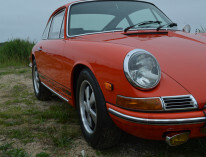 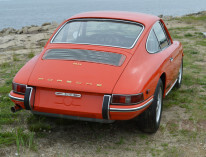 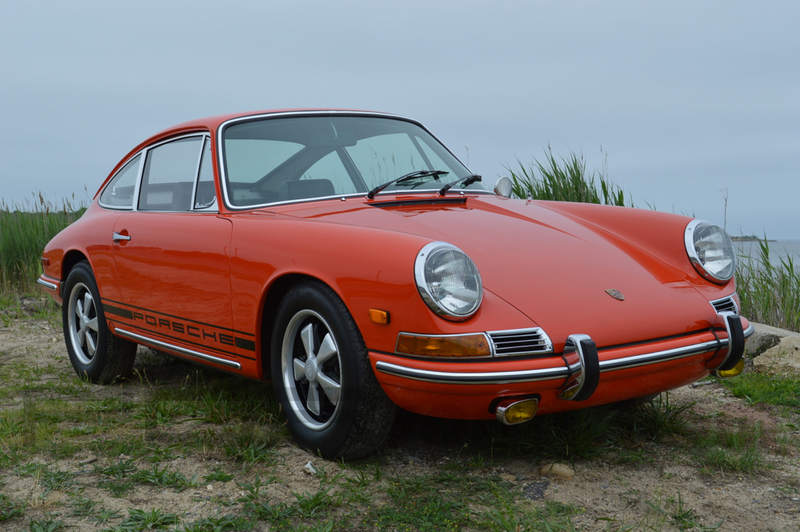 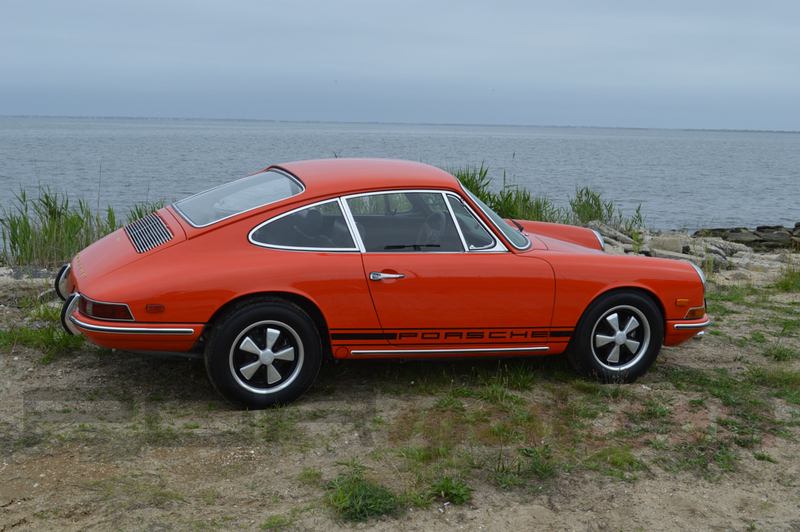 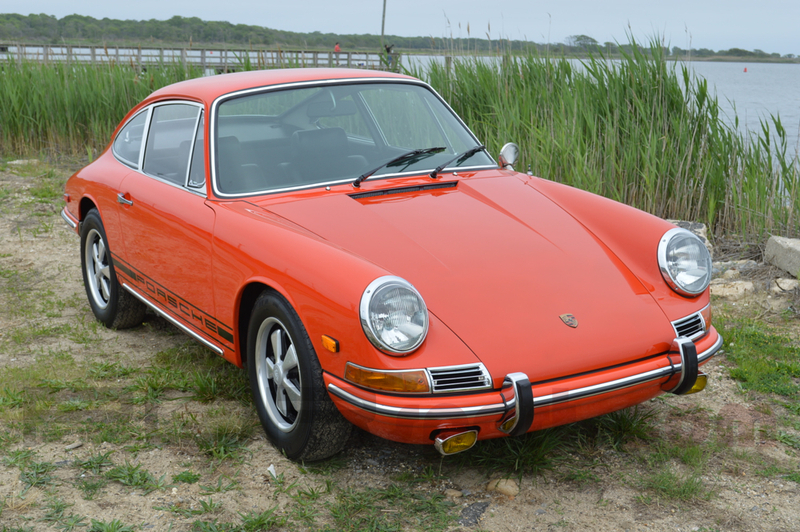 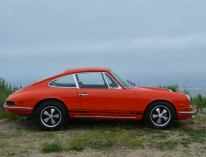 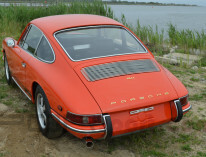 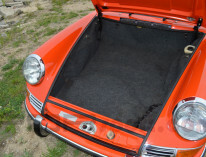 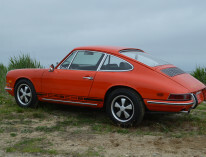 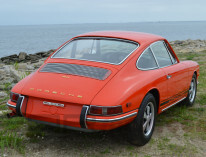 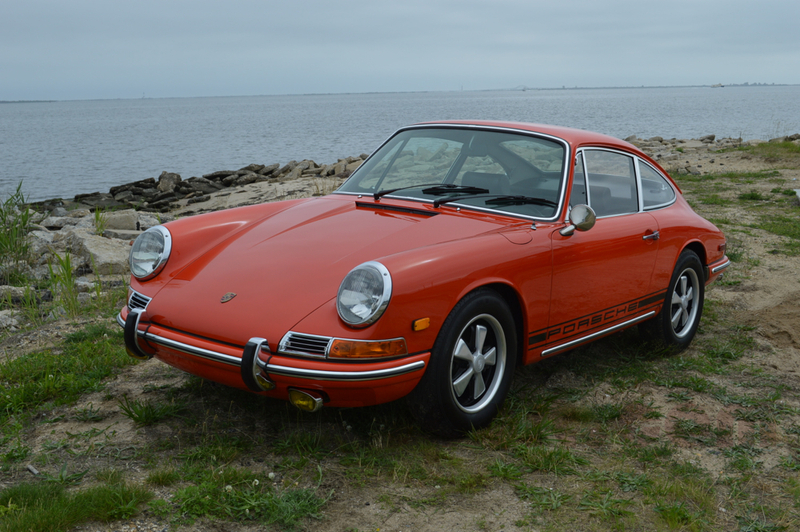 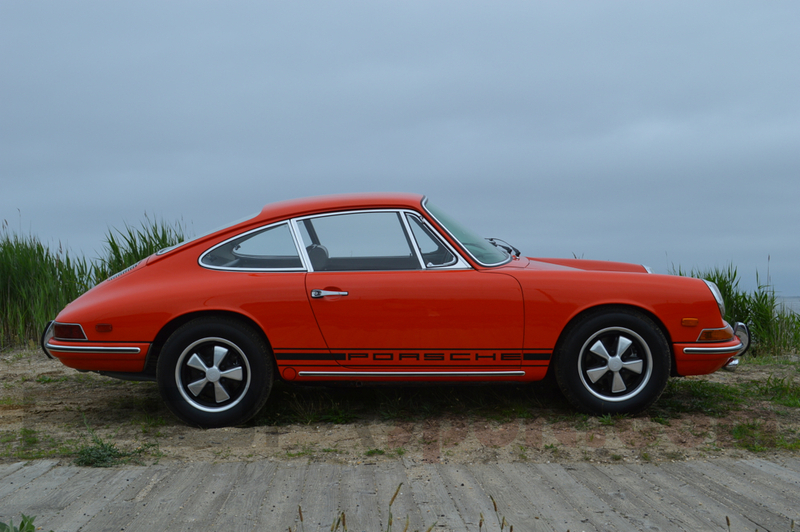 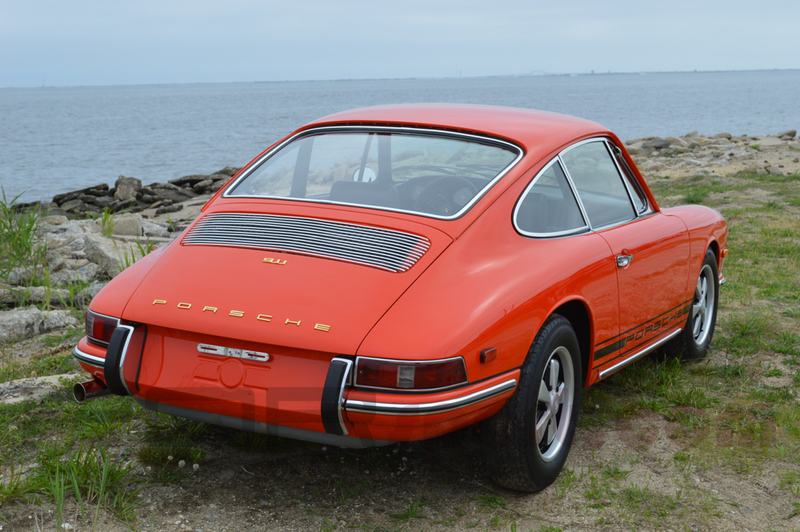 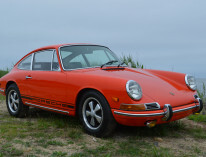 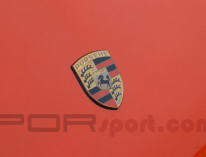 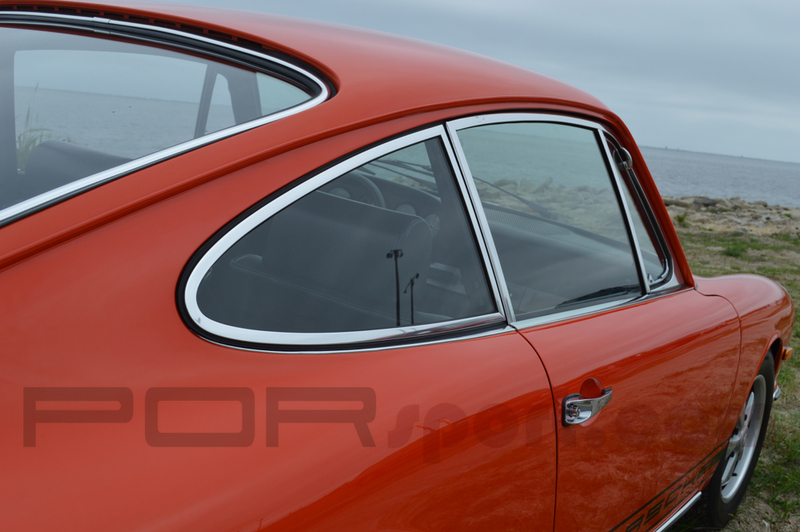 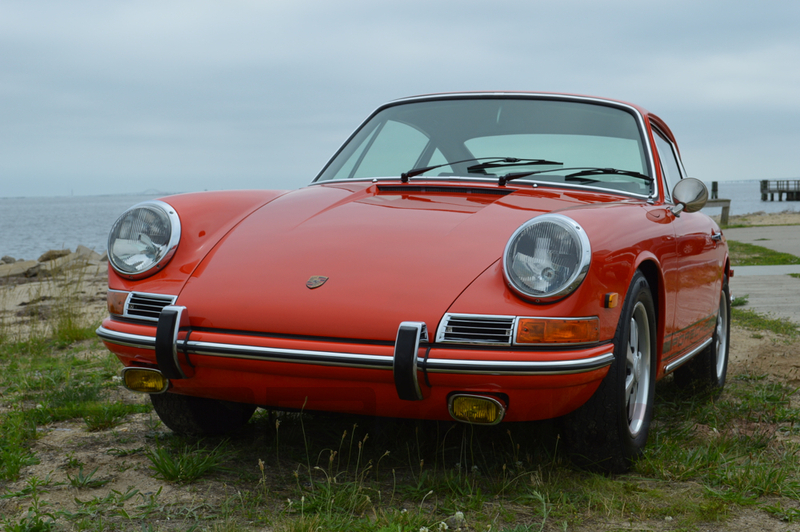 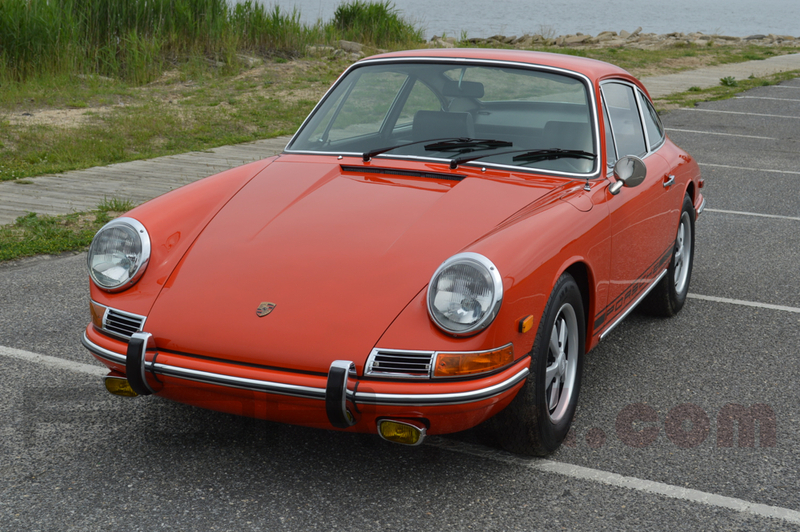 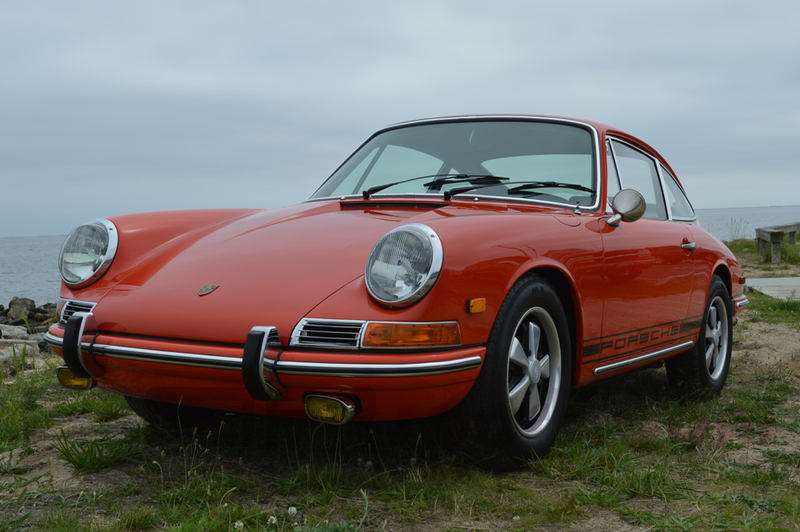 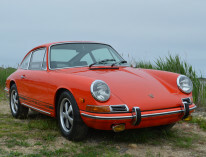 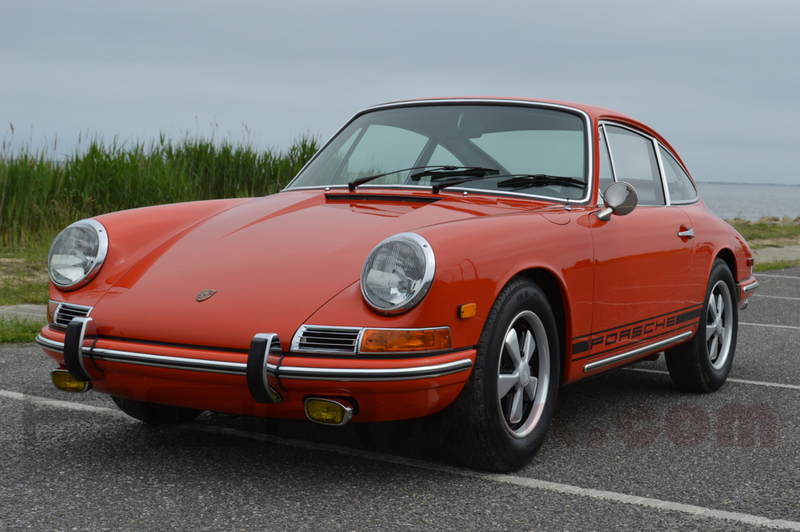 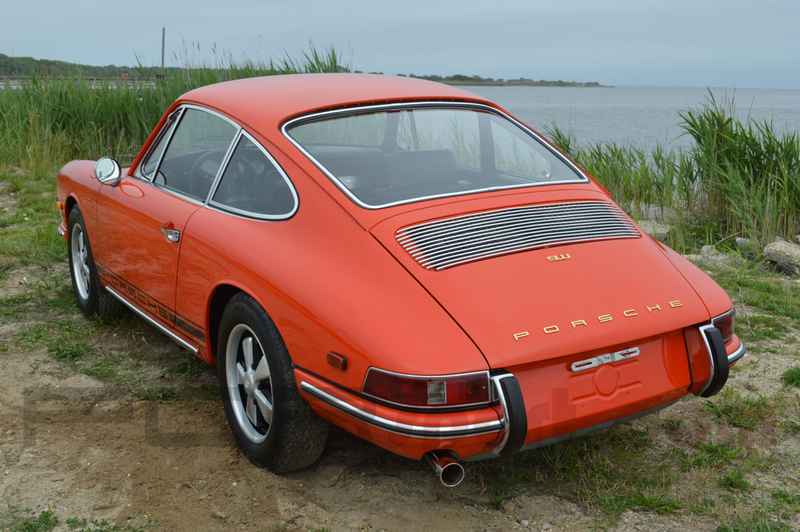 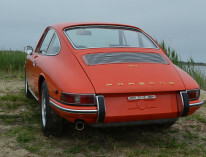 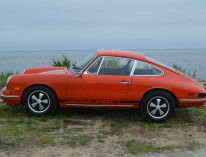 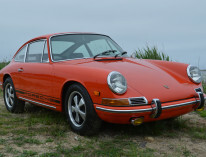 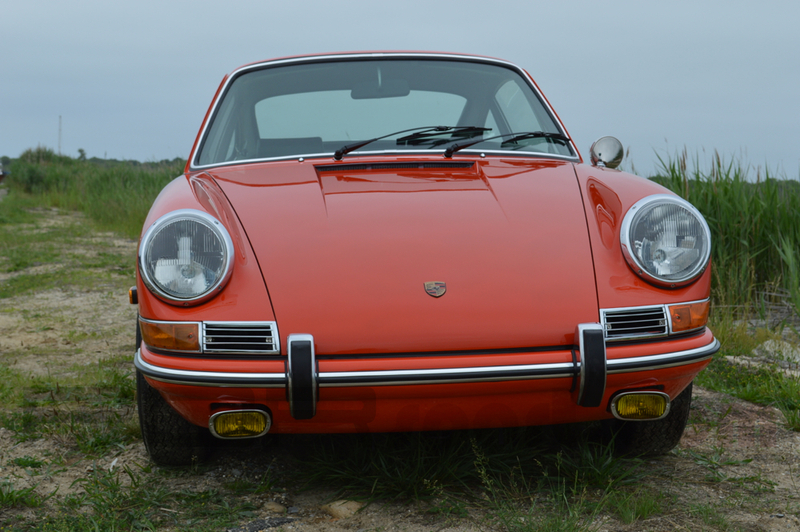 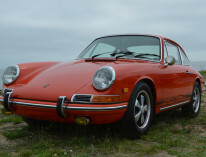 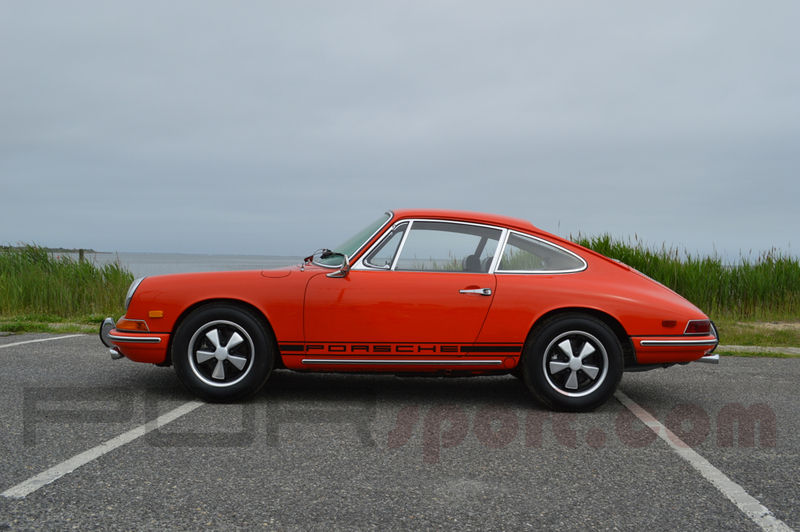 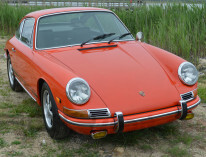 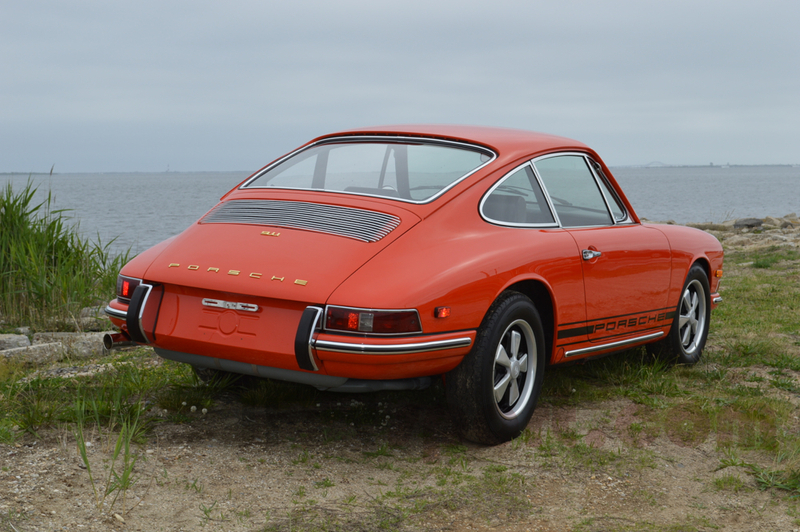 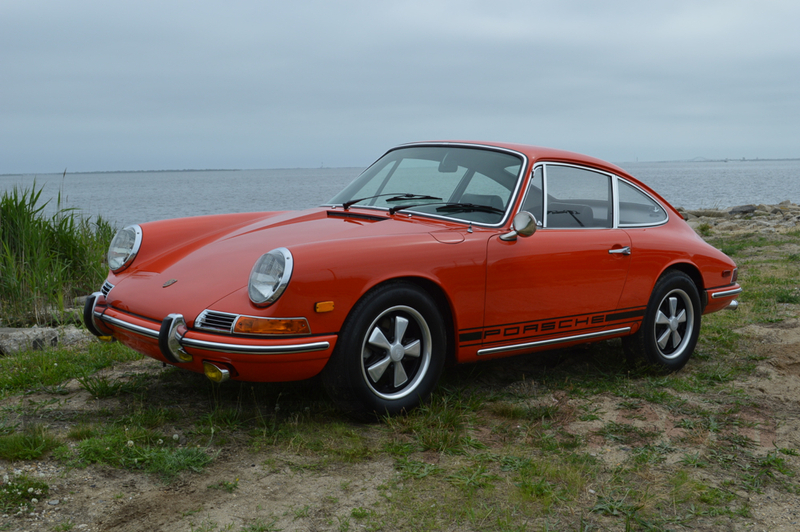 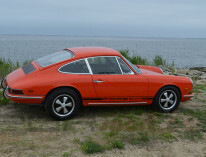 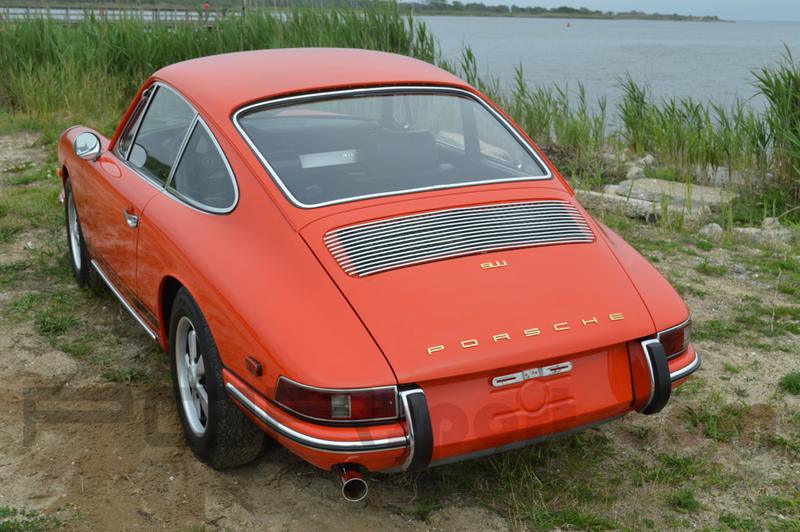 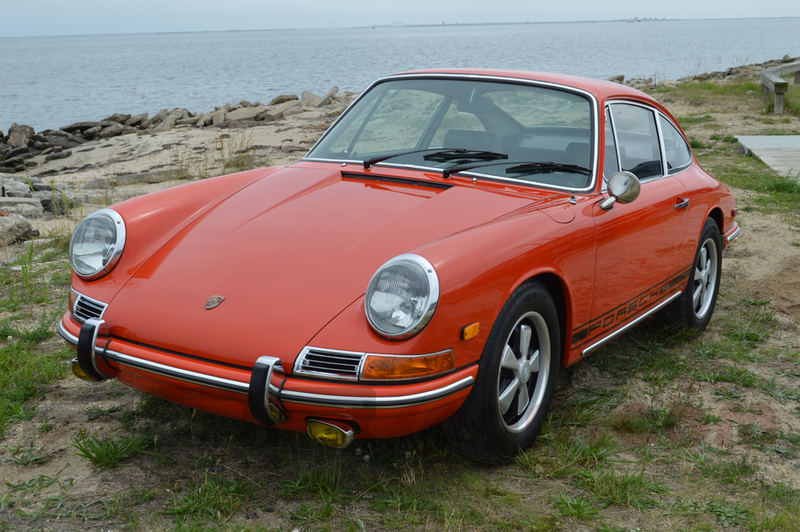 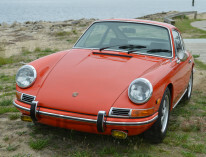 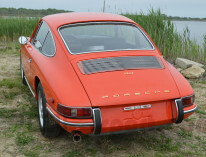 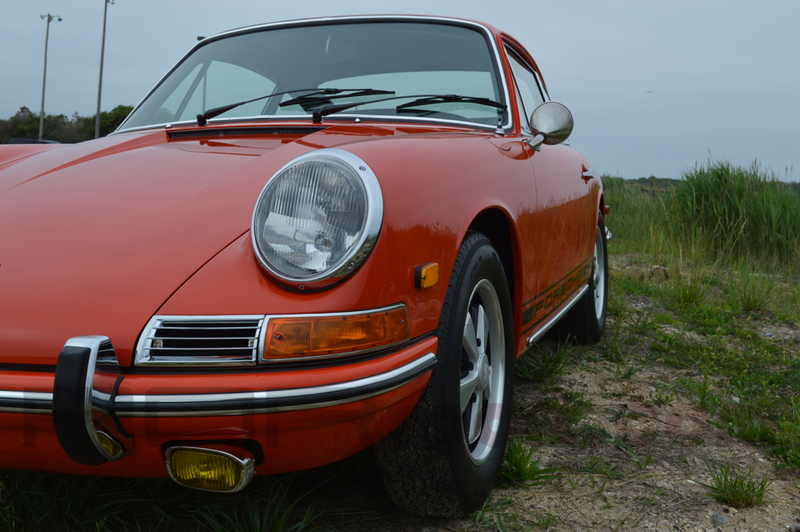 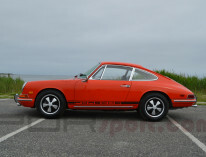 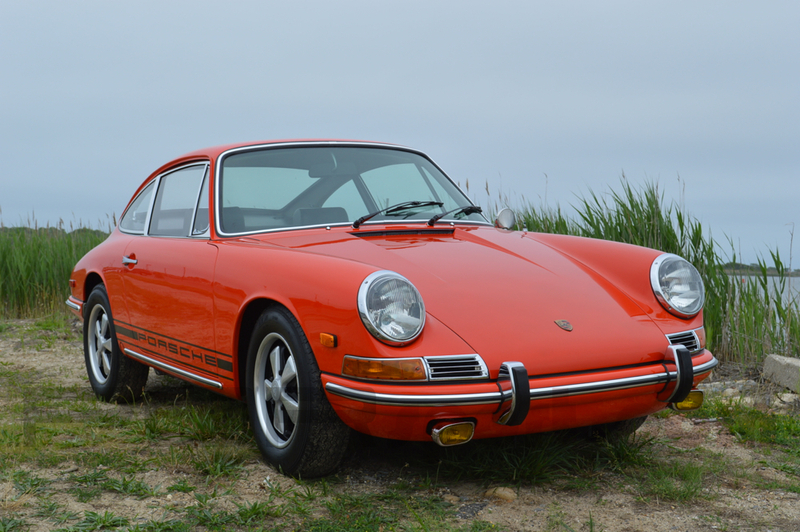 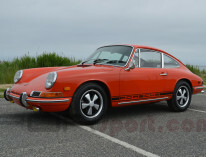 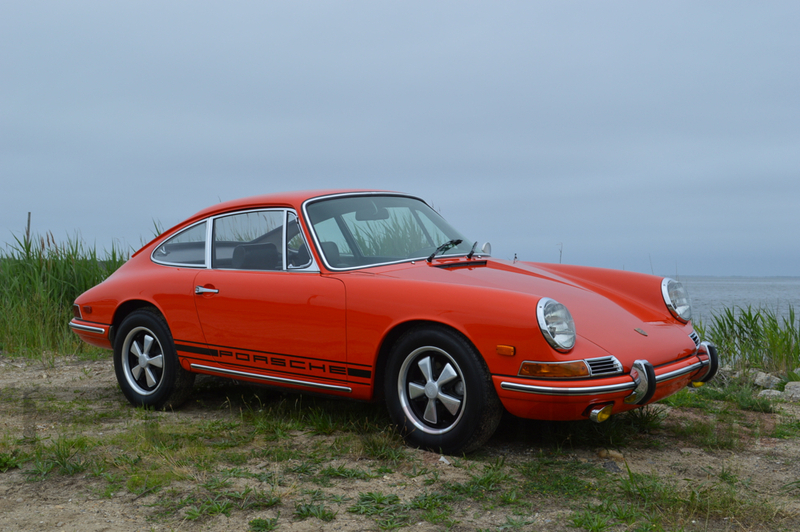 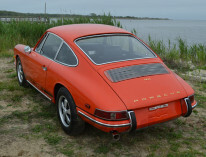 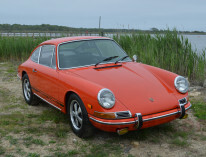 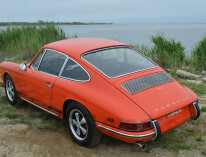 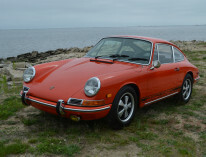 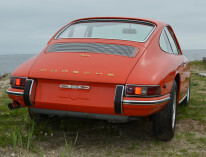 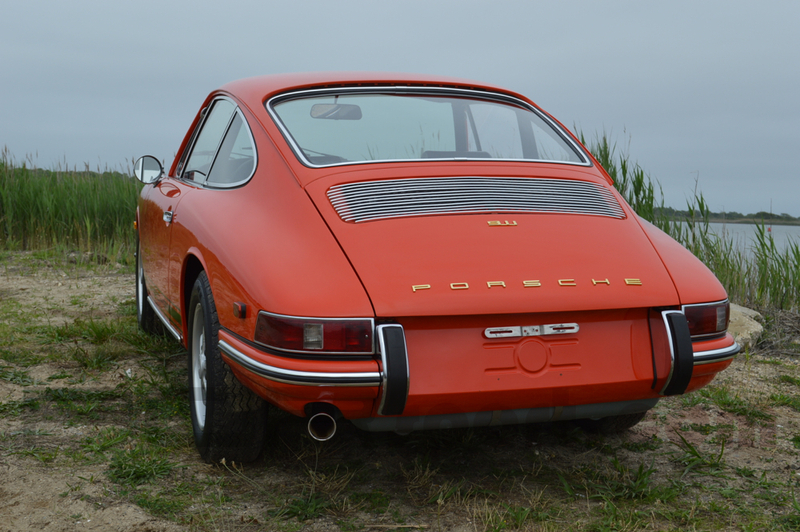 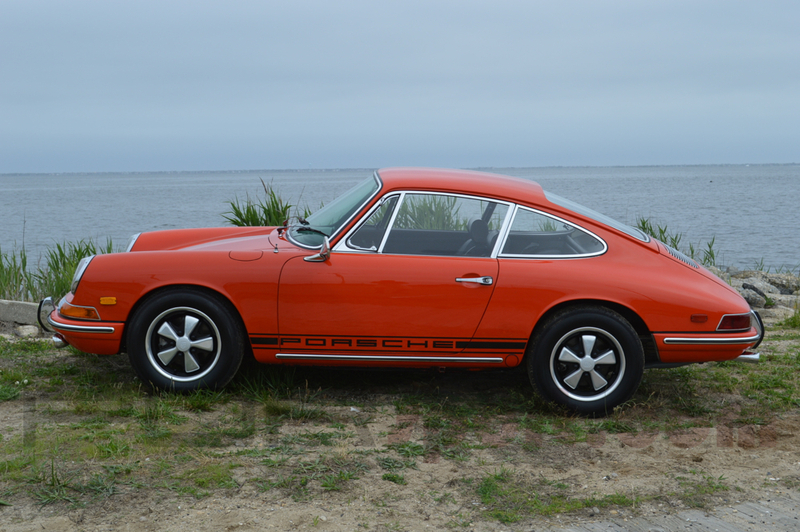 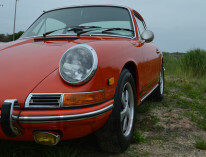 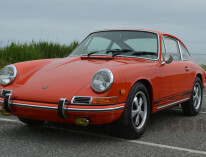 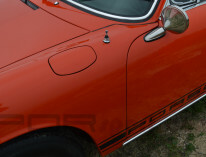 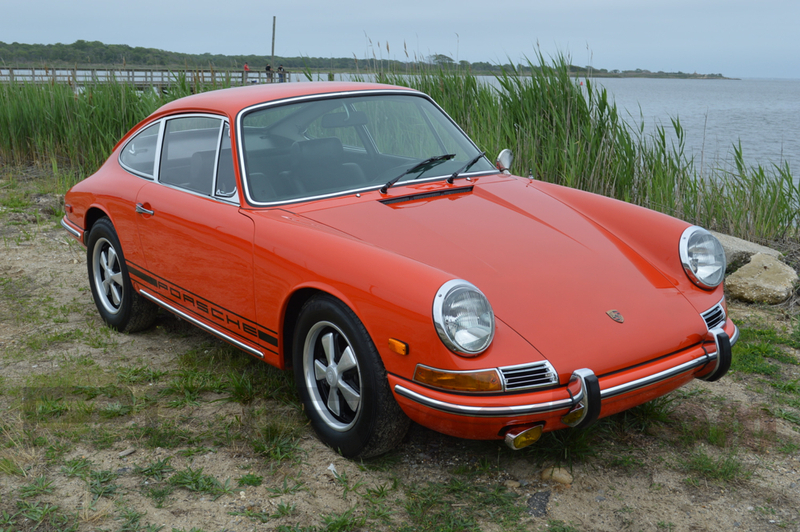 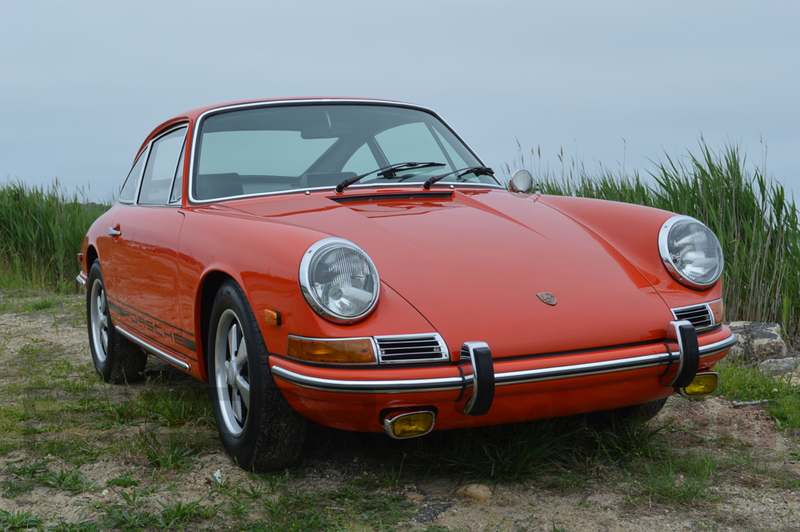 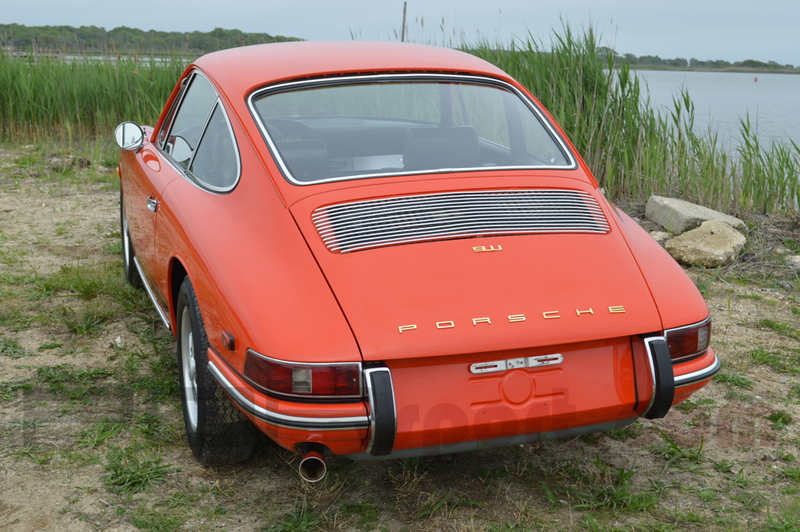 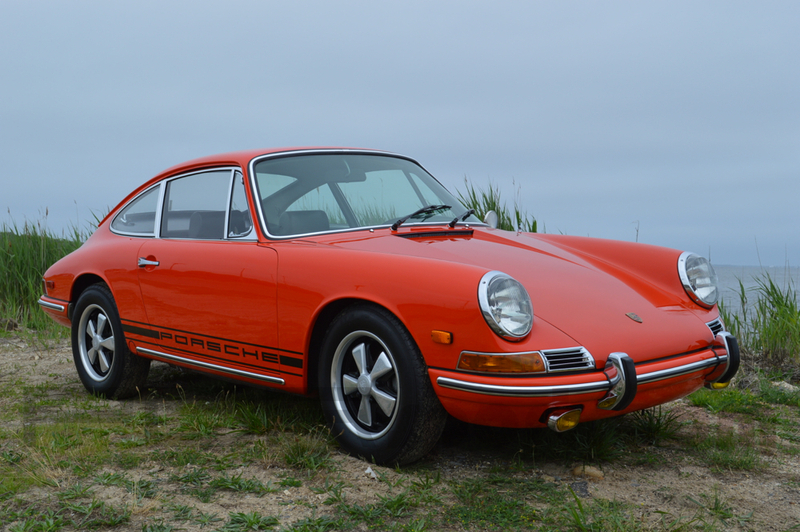 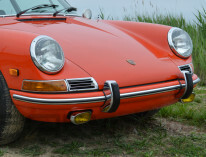 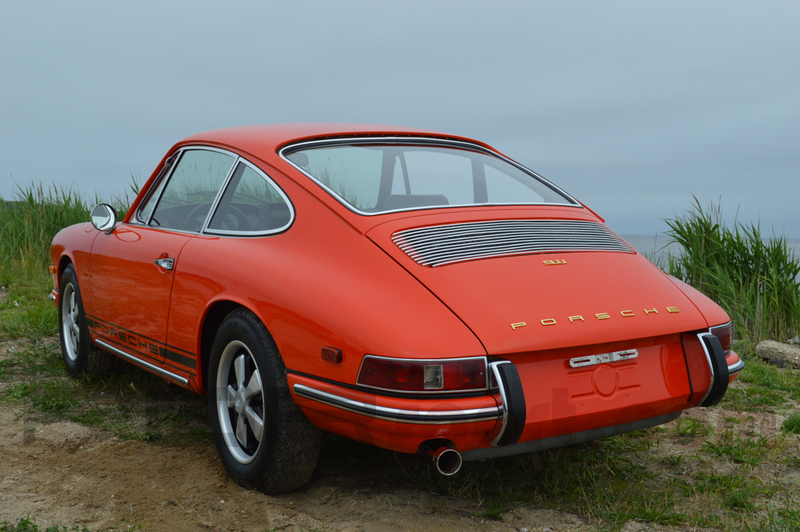 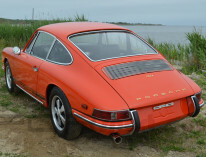 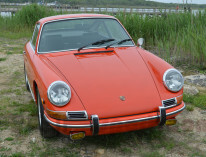 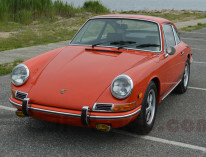 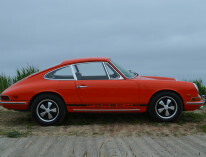 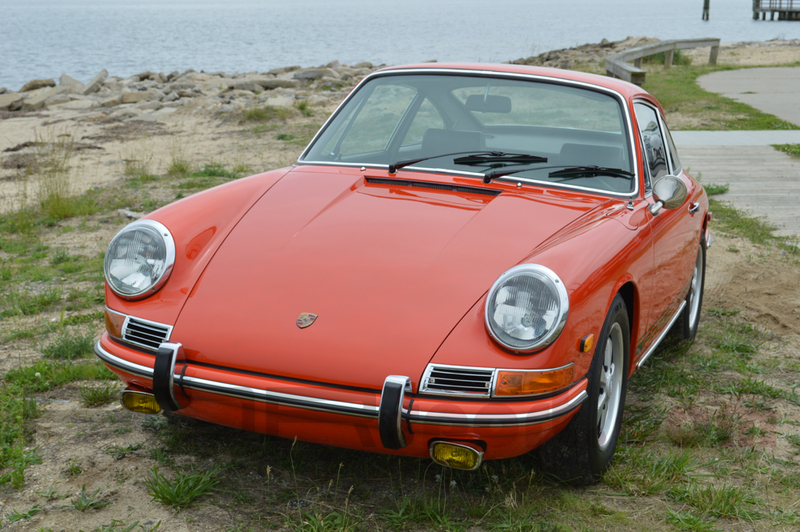 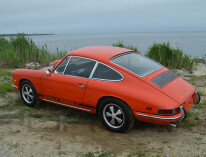 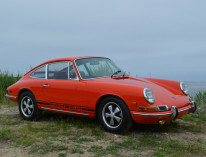 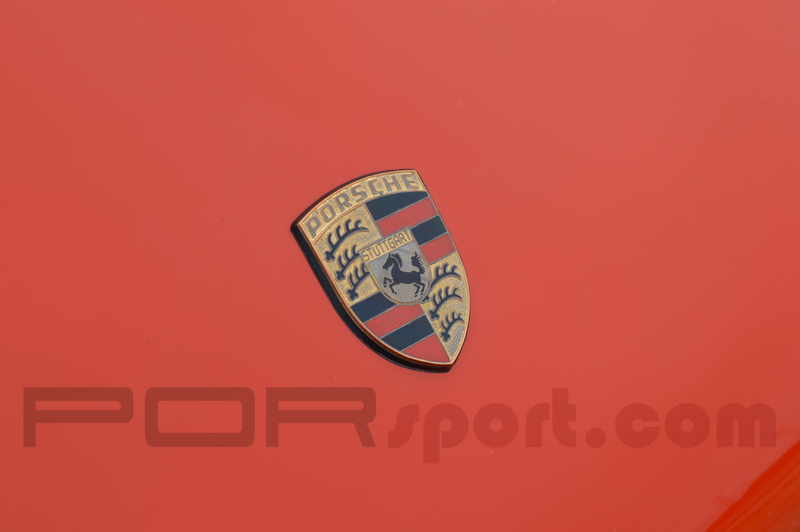 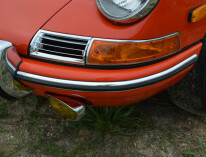 This Plain Jane base 911 was delivered through Porsche Cars Northwest and lived its life in Oregon, a majority of that time with one loving owner. 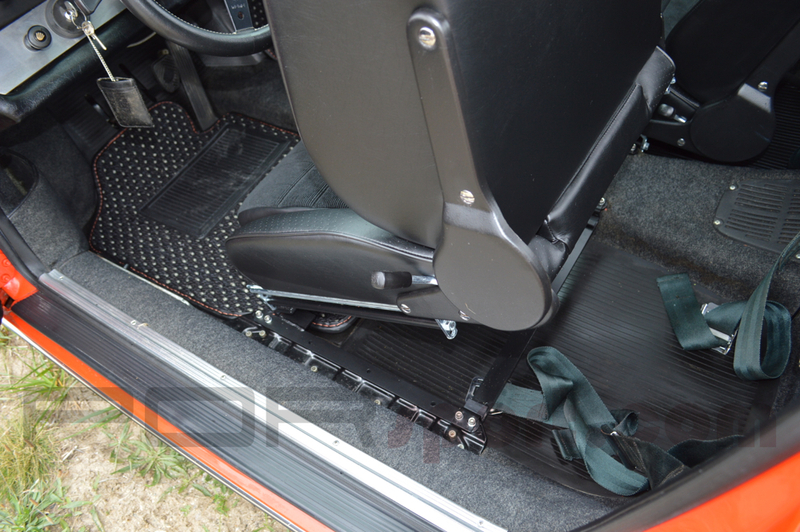 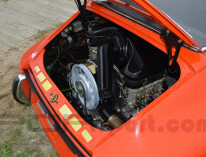 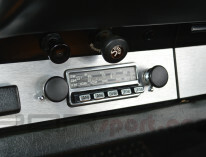 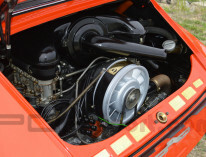 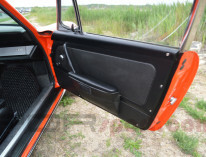 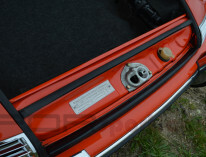 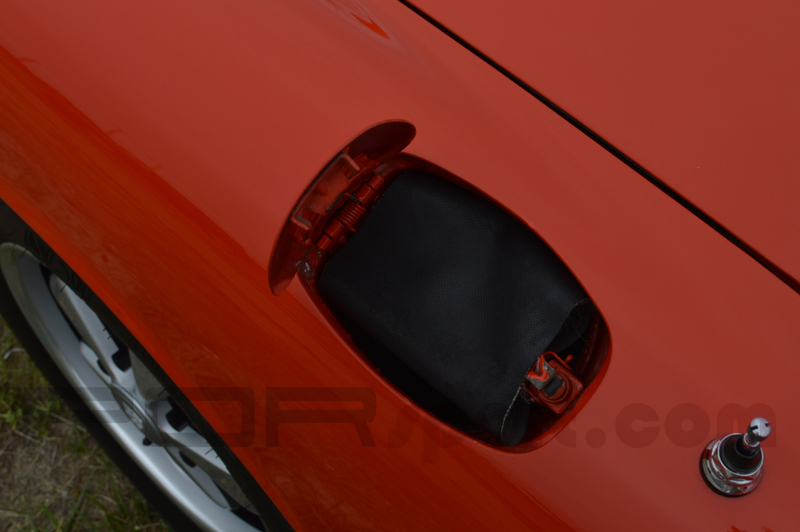 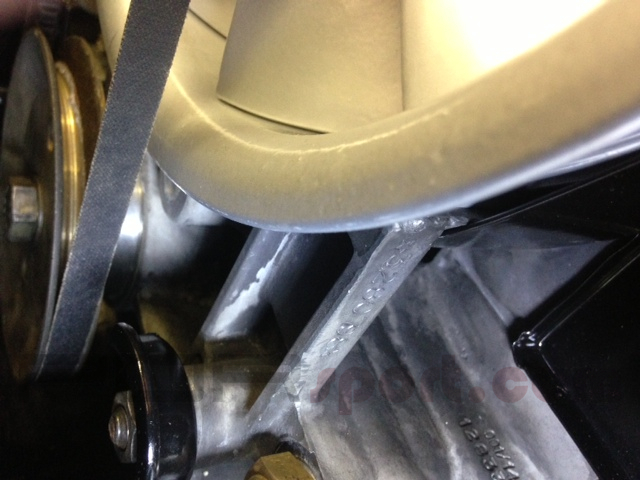 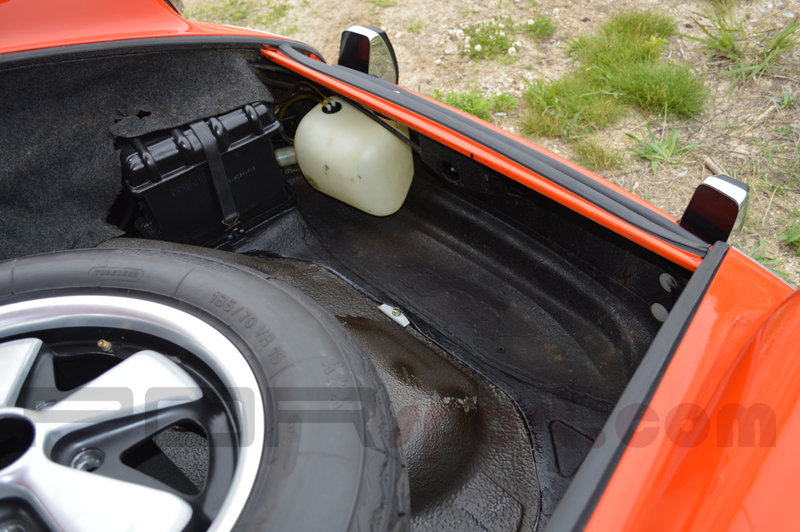 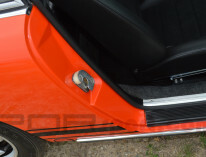 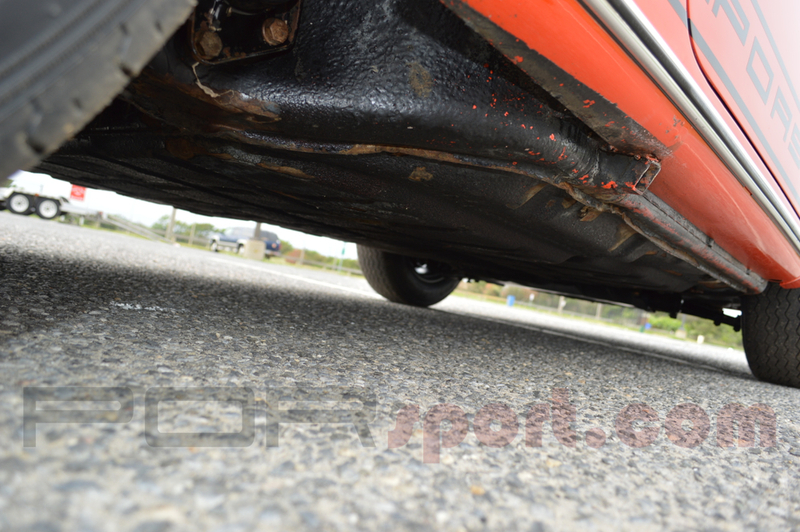 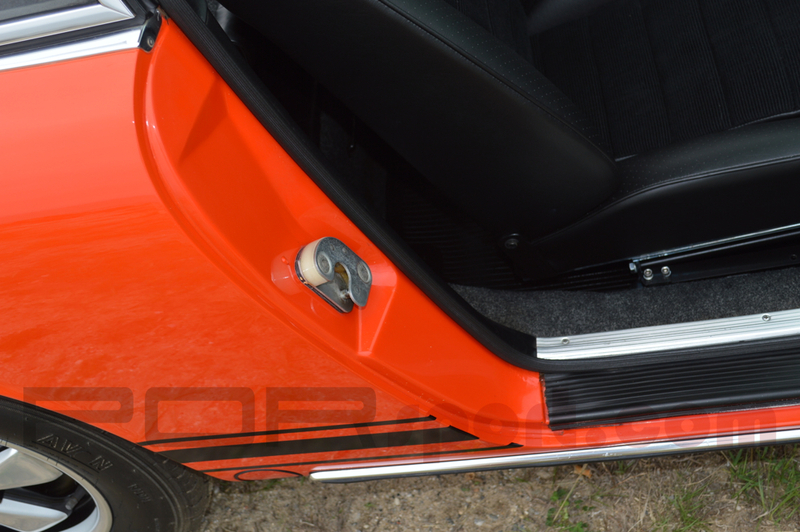 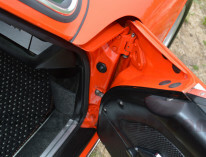 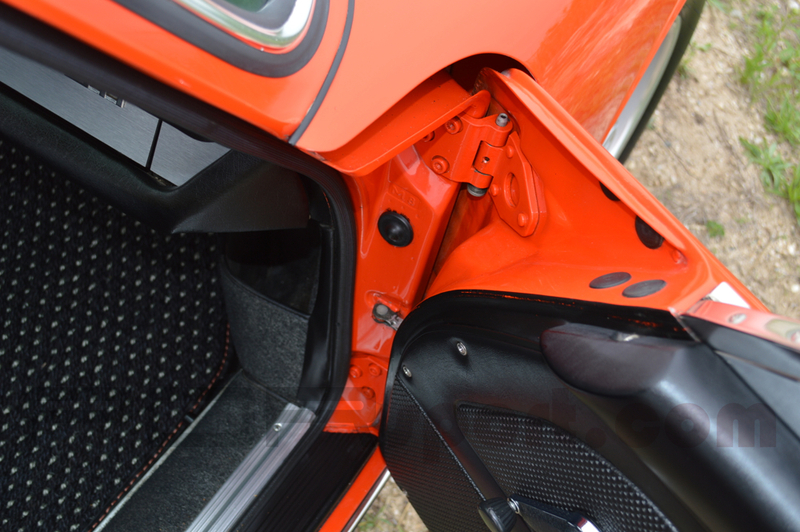 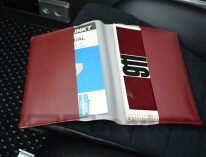 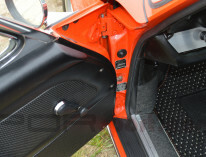 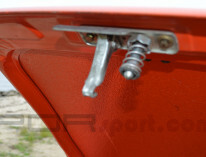 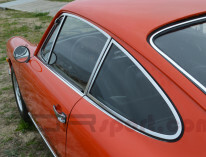 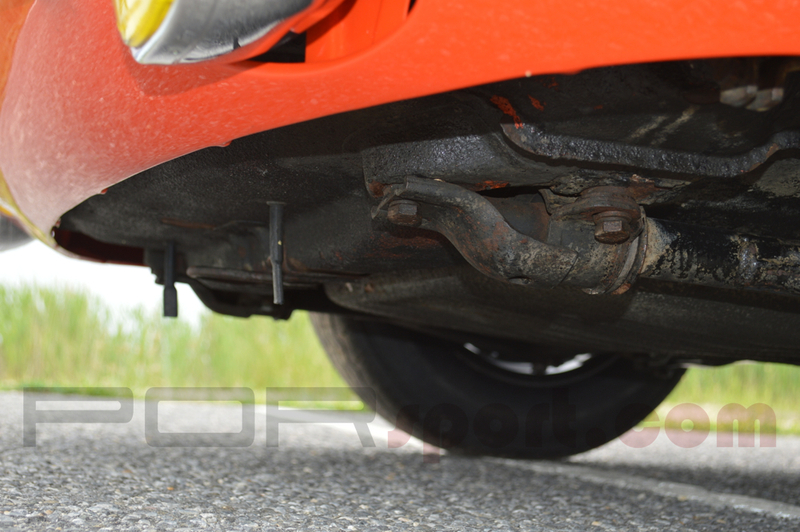 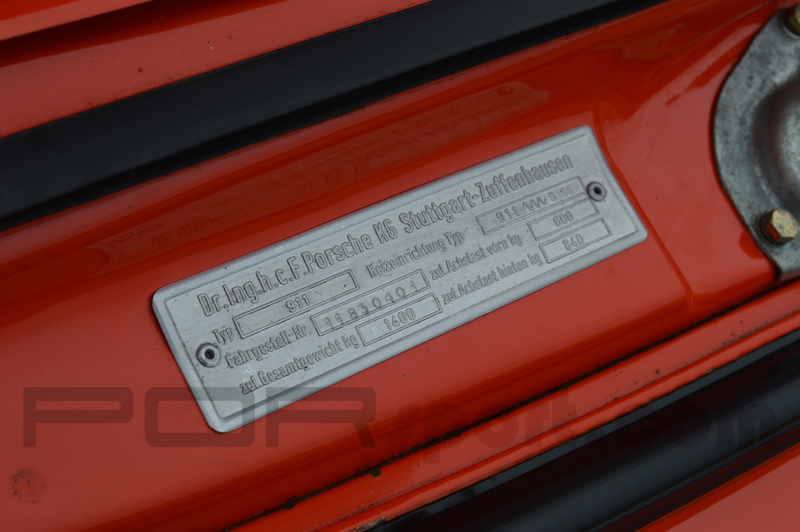 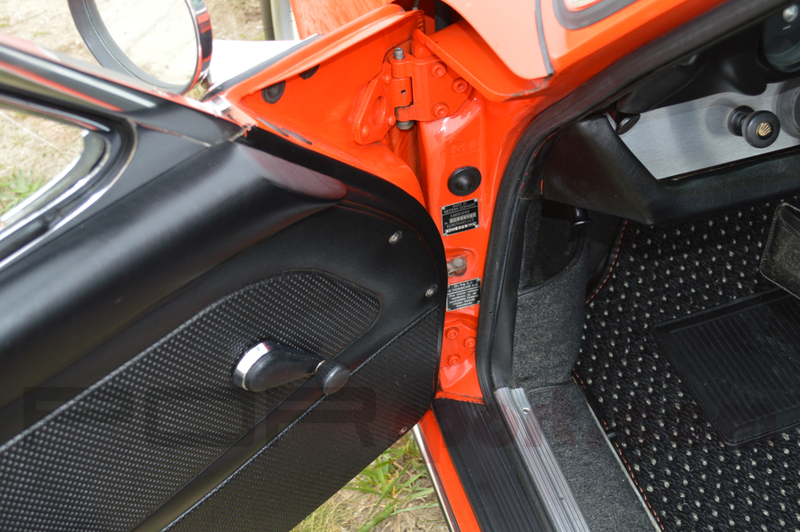 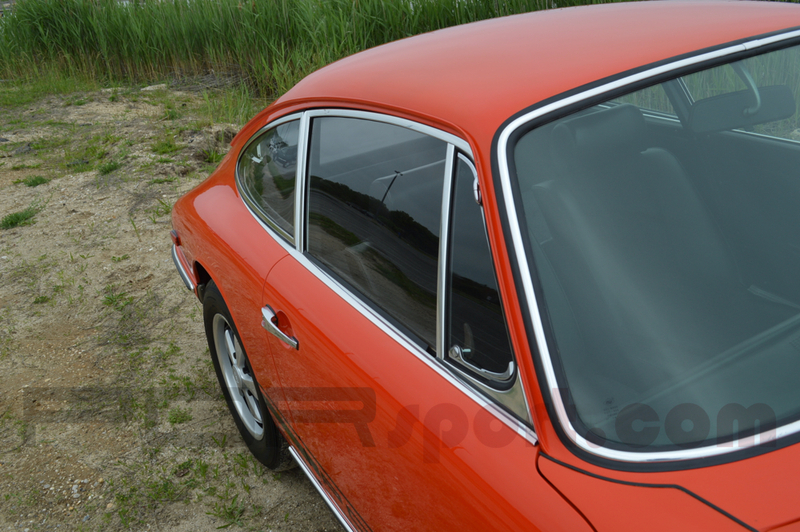 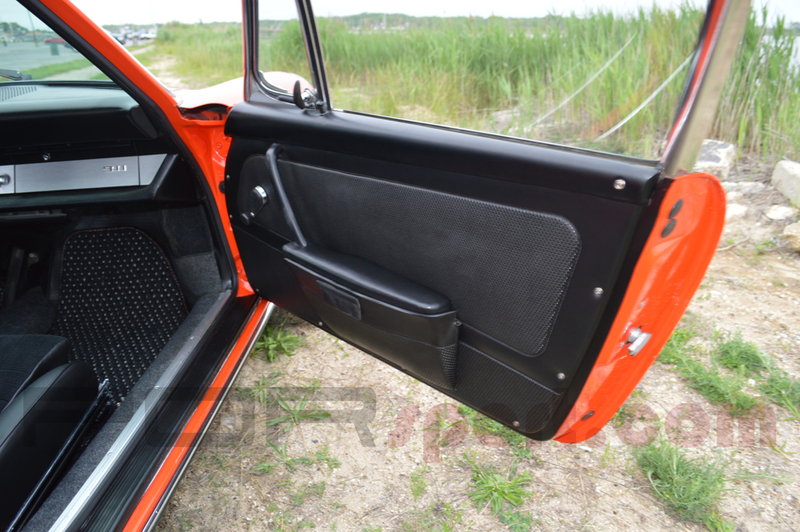 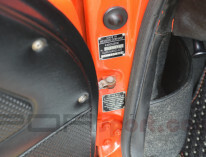 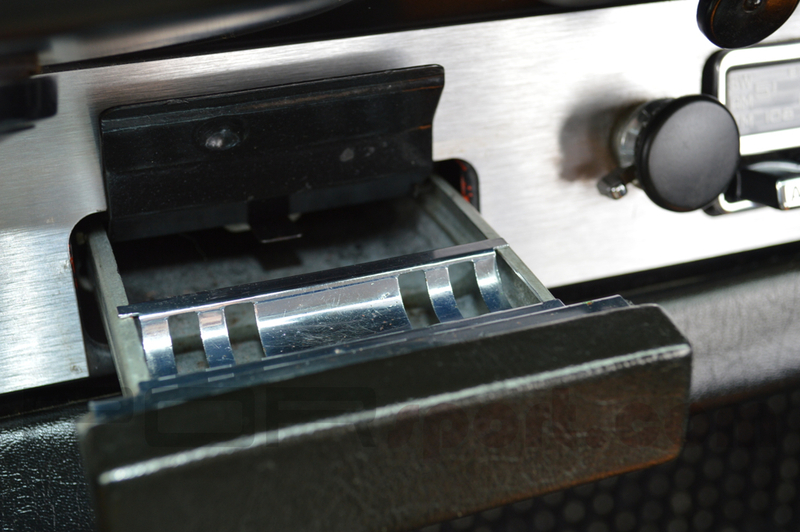 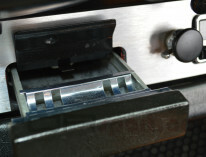 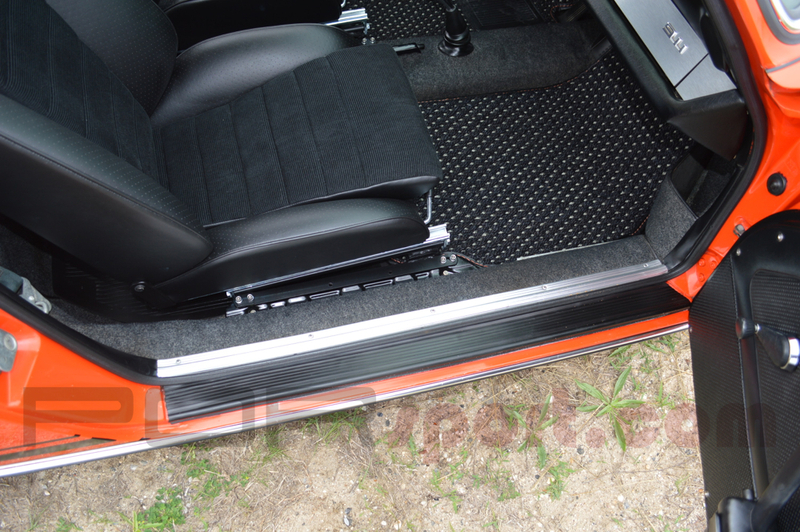 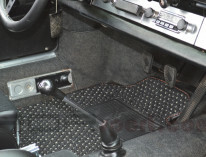 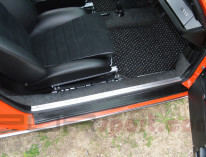 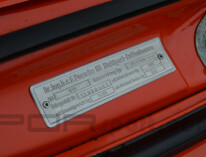 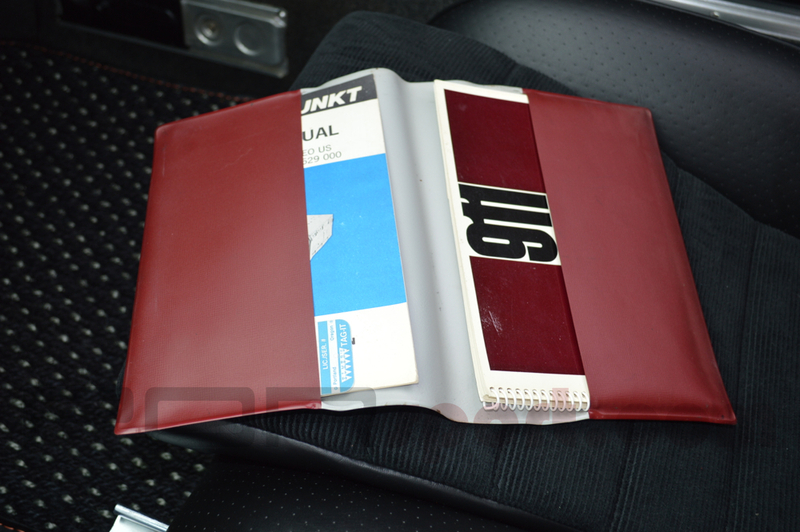 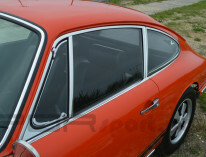 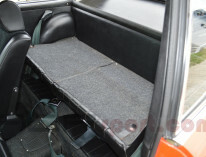 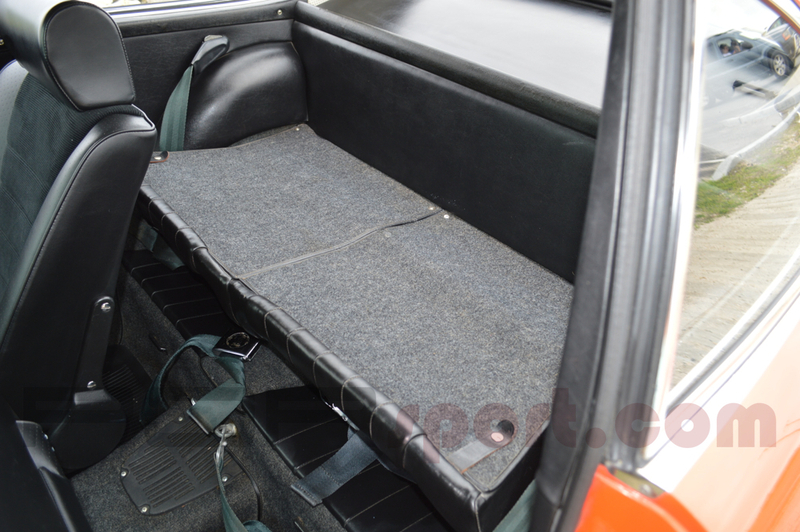 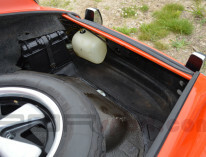 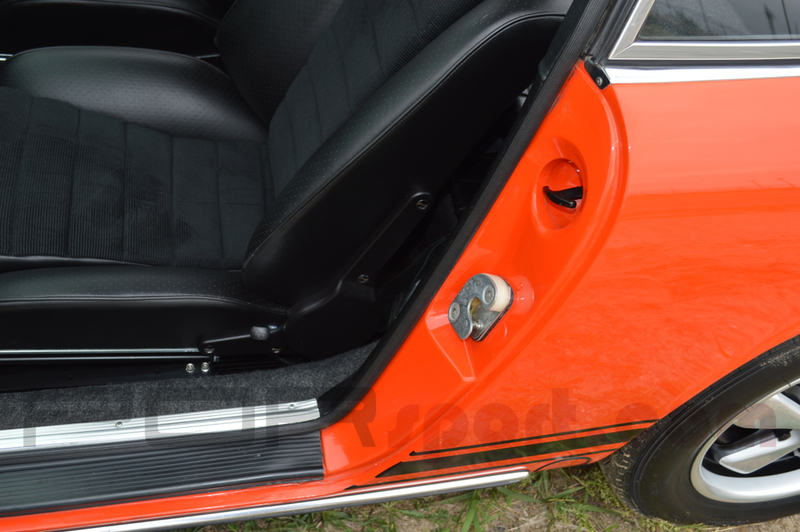 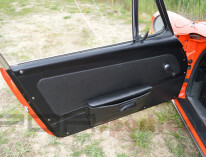 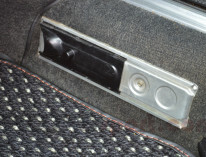 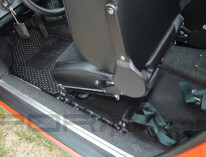 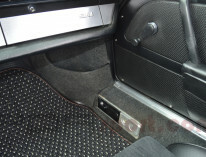 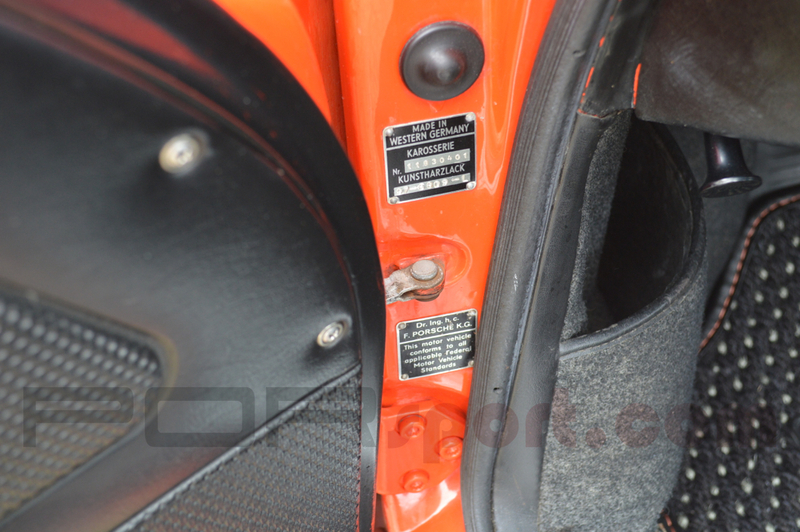 It is extremely solid with all original panels including floors and suspension pan. 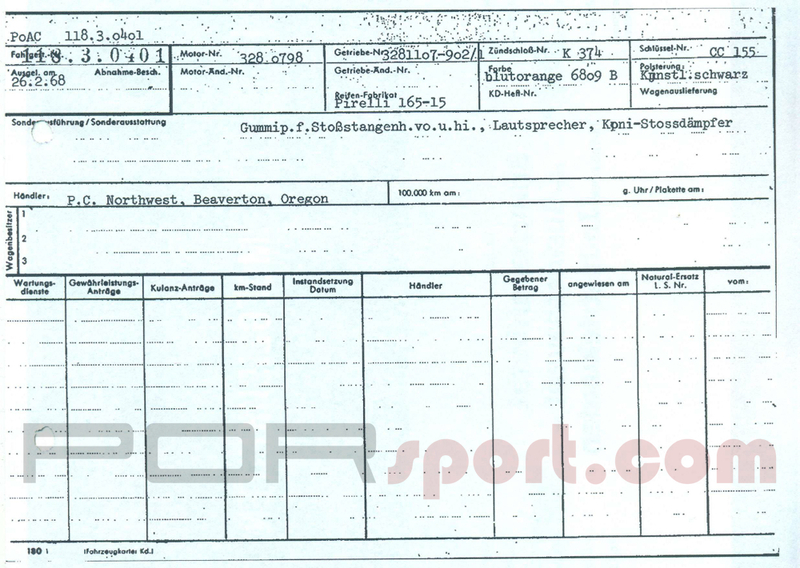 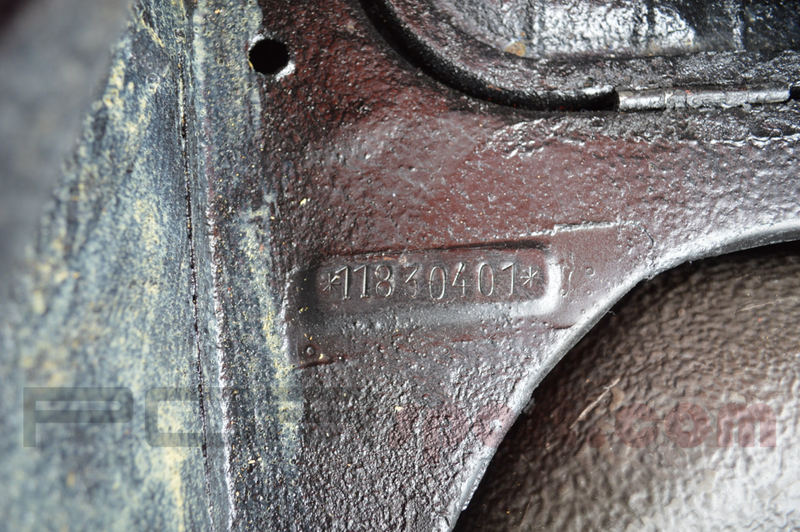 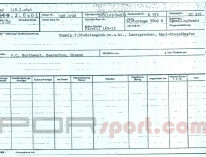 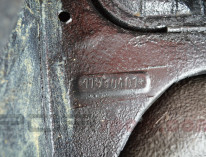 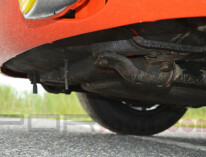 There is no evidence of rust or crash repairs. 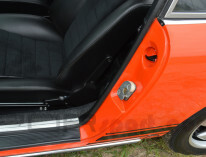 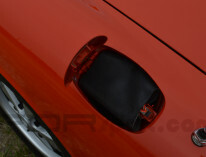 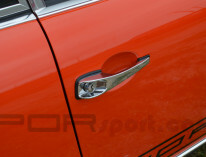 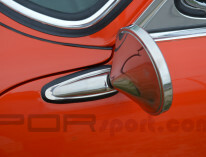 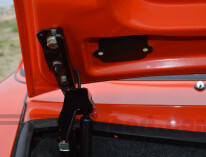 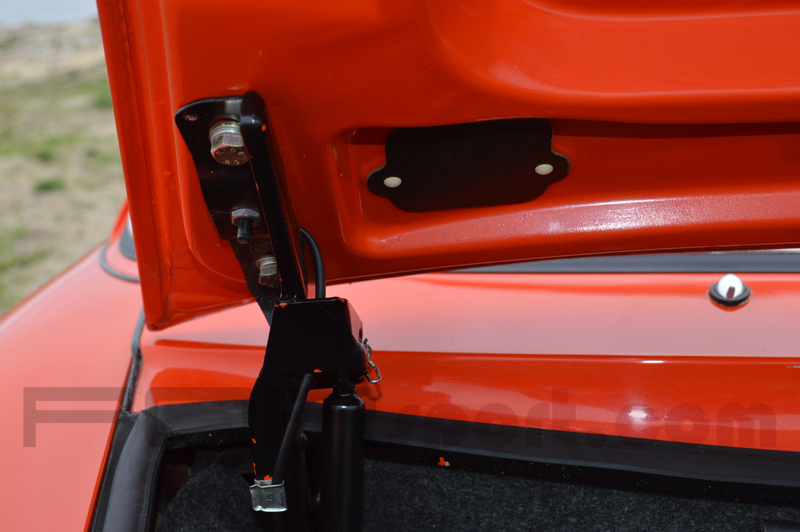 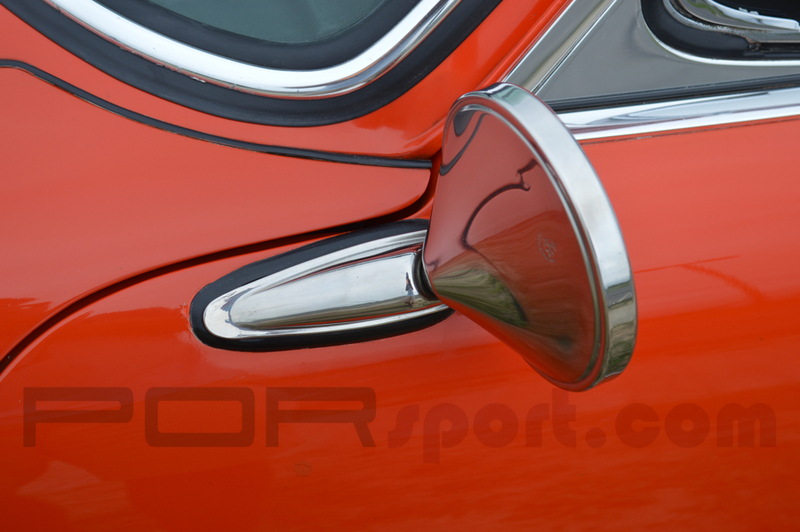 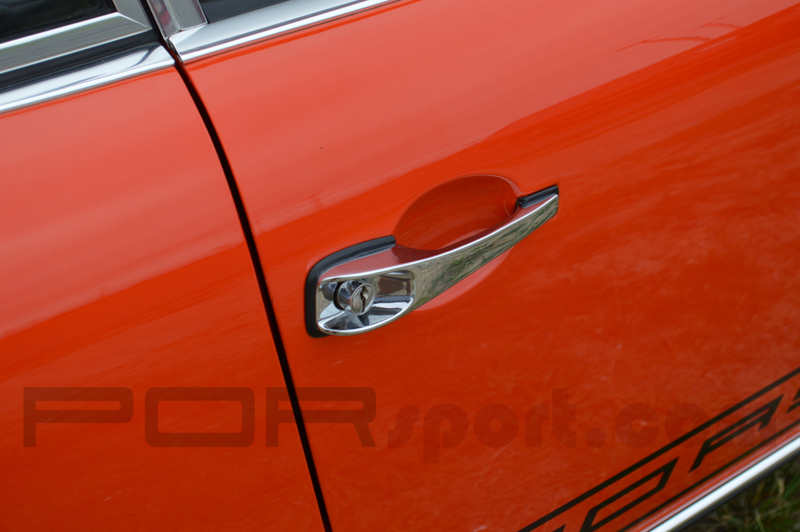 The doors, fenders, bumpers and lids are all original to this car. 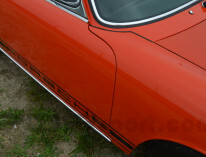 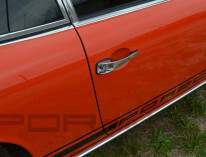 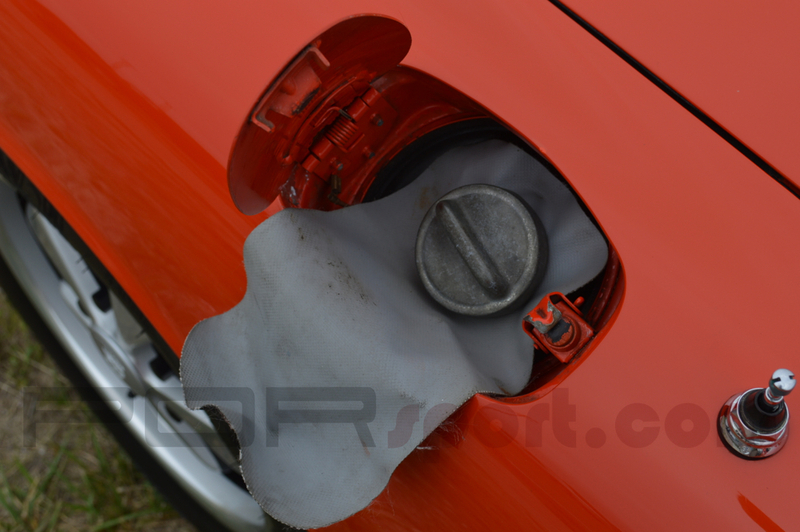 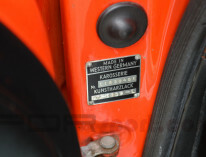 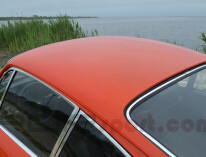 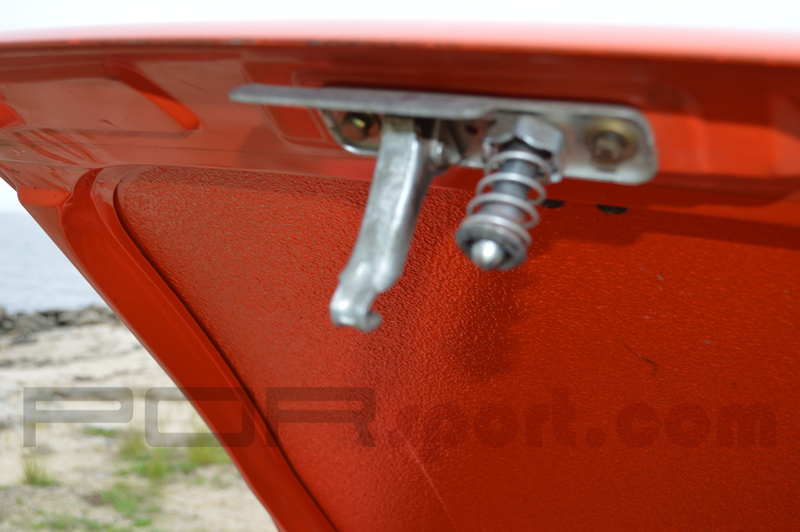 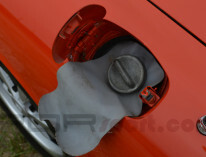 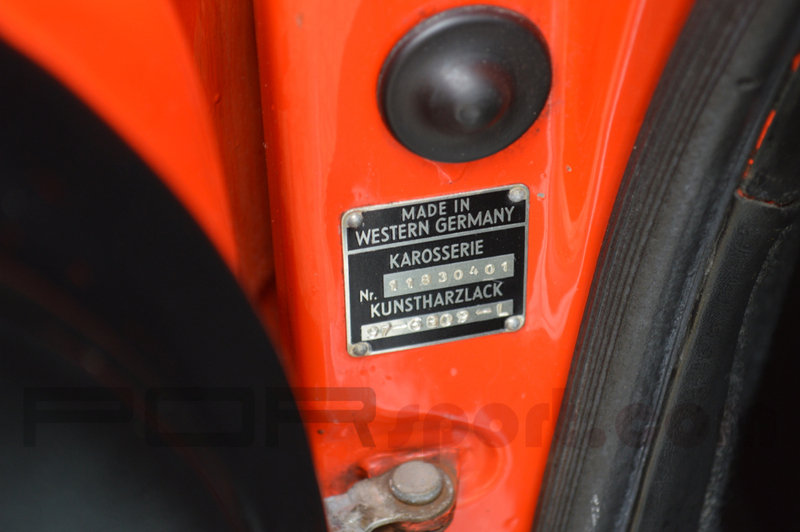 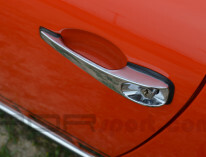 The Tangerine paint is in outstanding condition and is about half original. 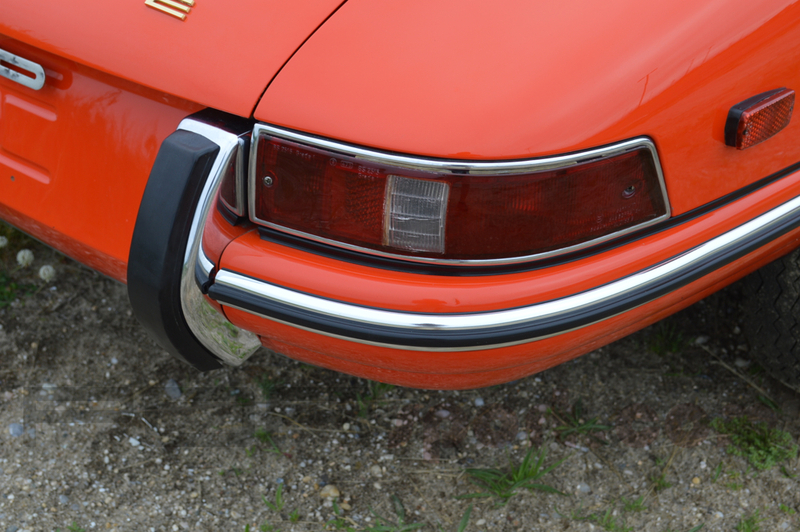 The paint finish is bright, shiny and with even texture and patina. 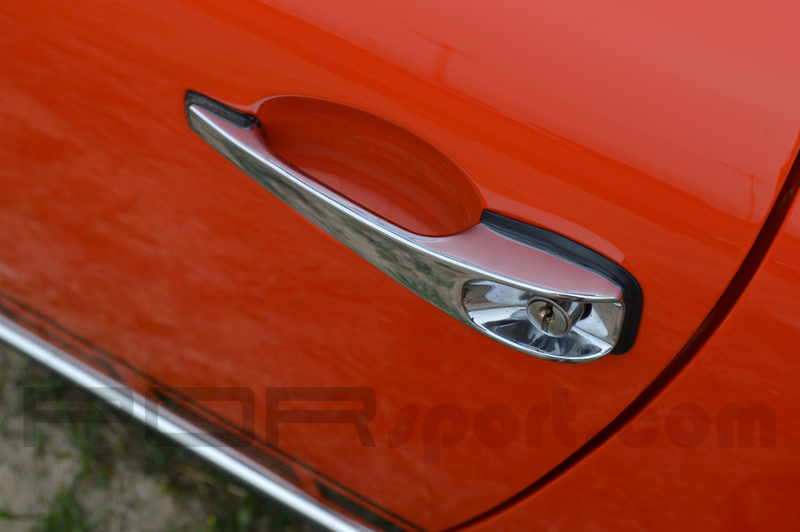 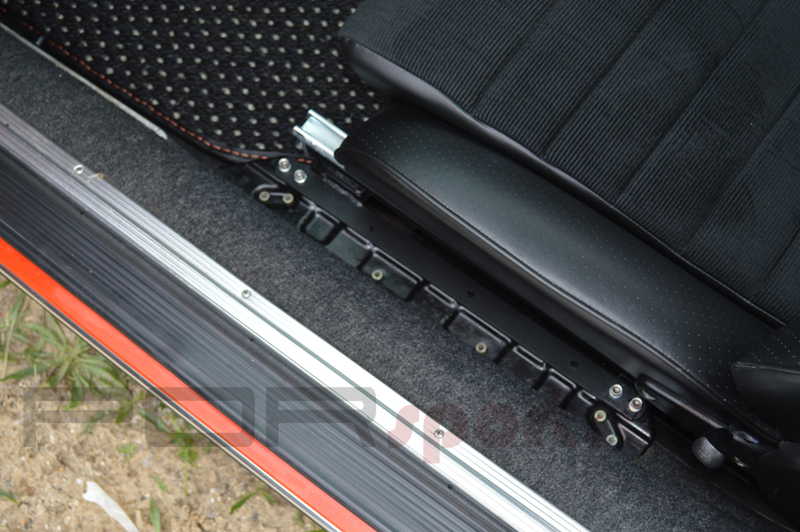 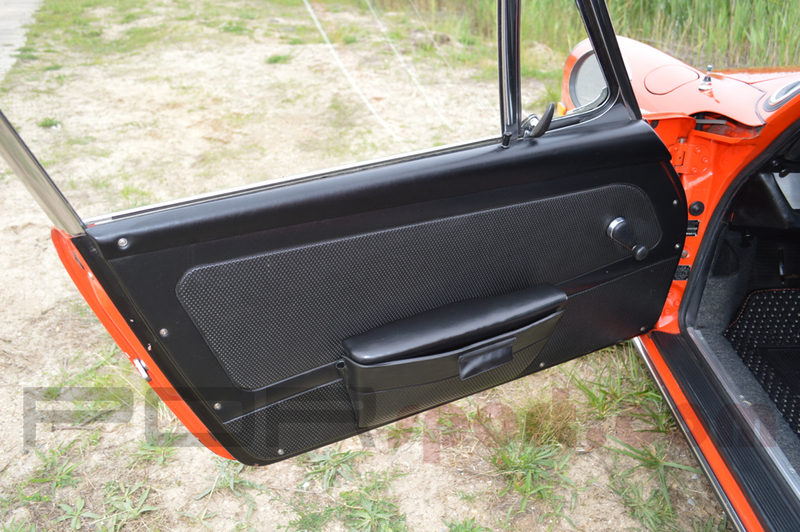 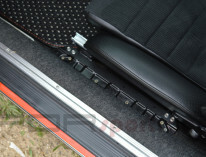 The body is exceptionally straight with great panel fit and great gaps. 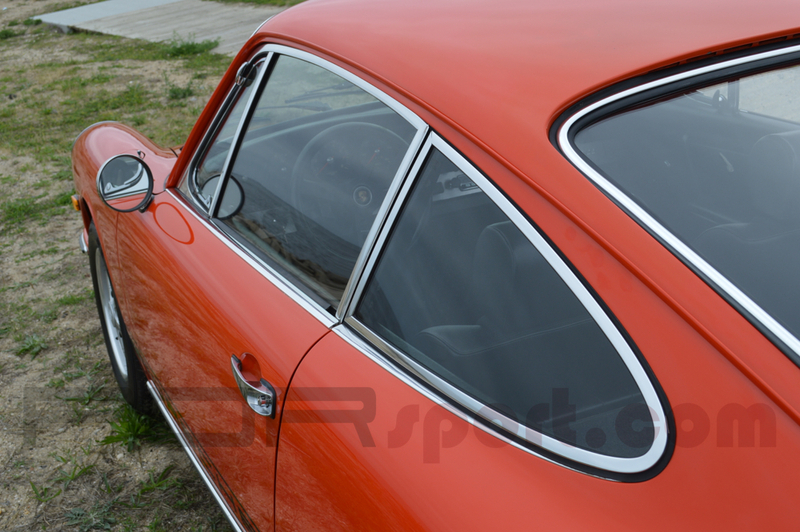 The window frames and glass are absolutely beautiful. 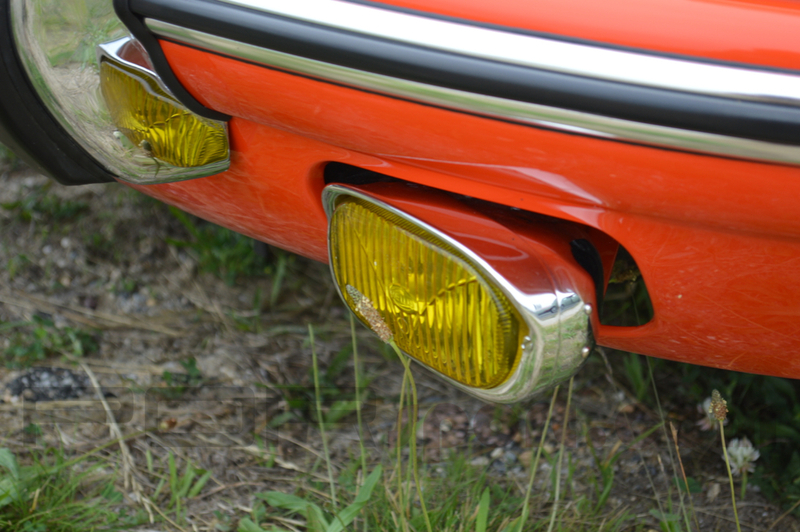 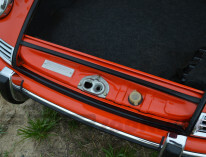 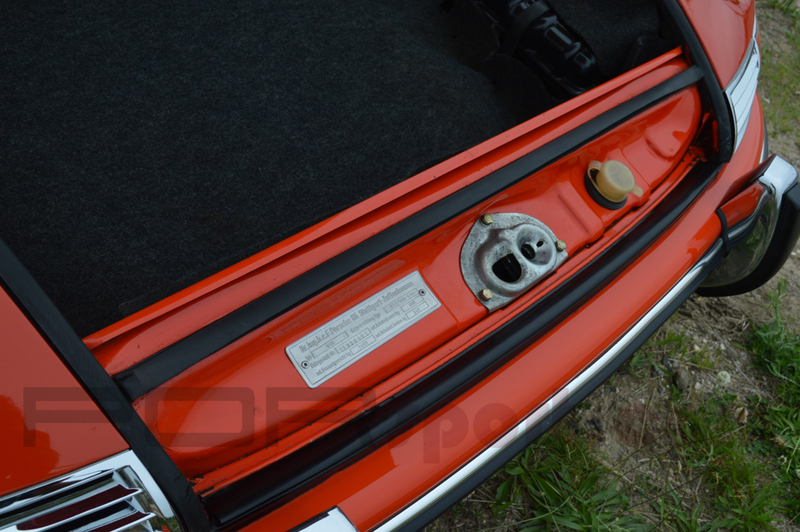 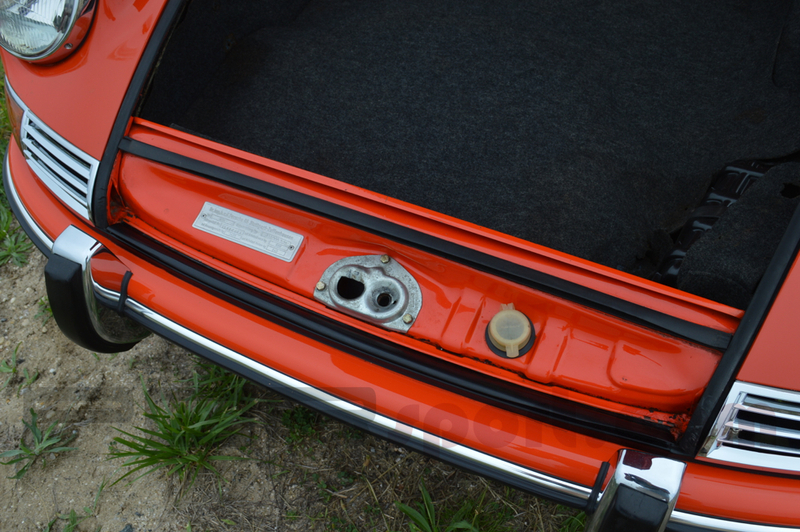 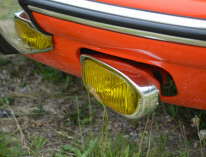 Great original light assemblies and great original orange bar hood crest. 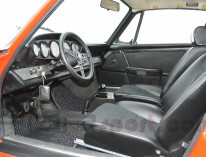 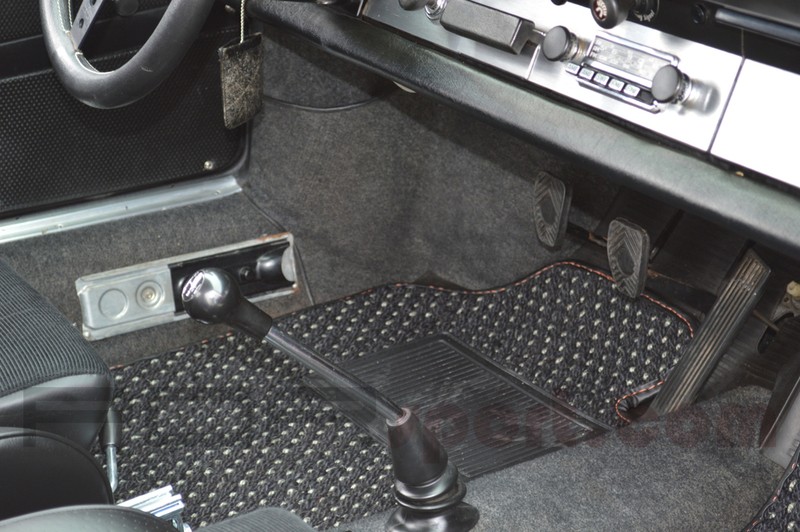 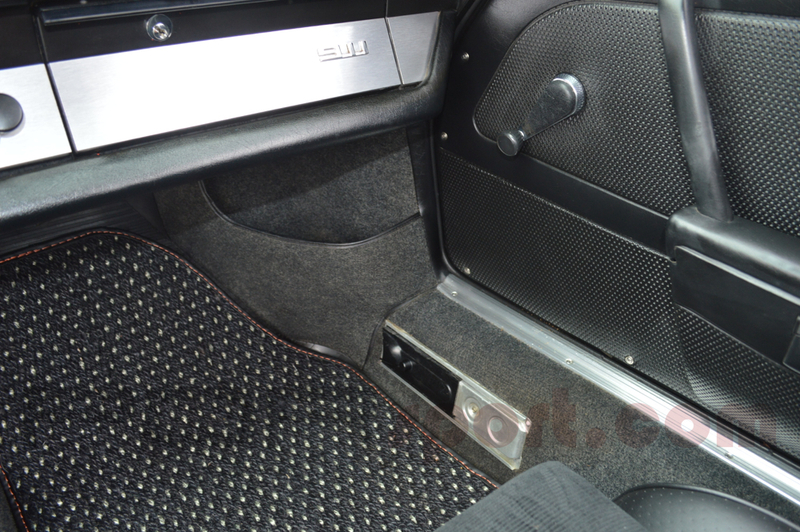 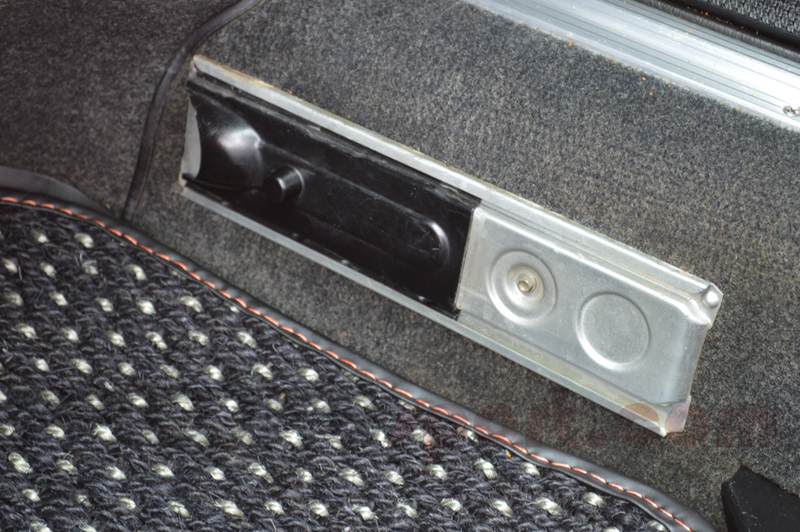 The original interior is outstanding with all original Perlon carpeting, perfect uncut original door panels and a perfect dash. 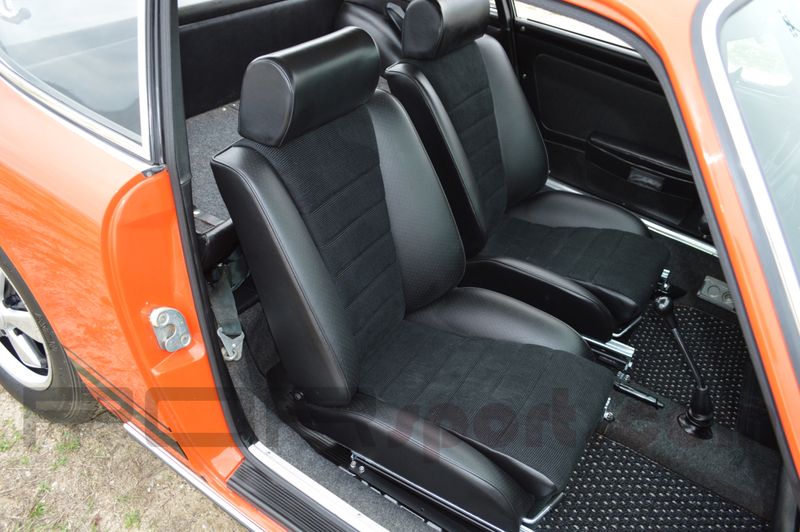 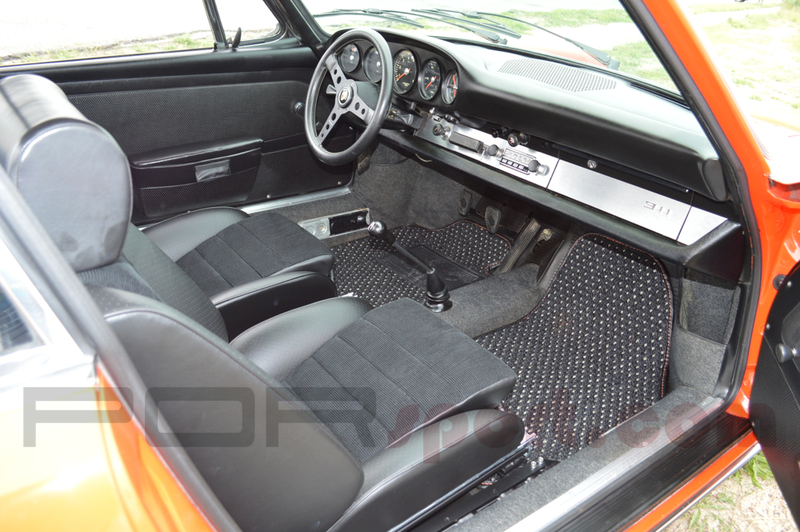 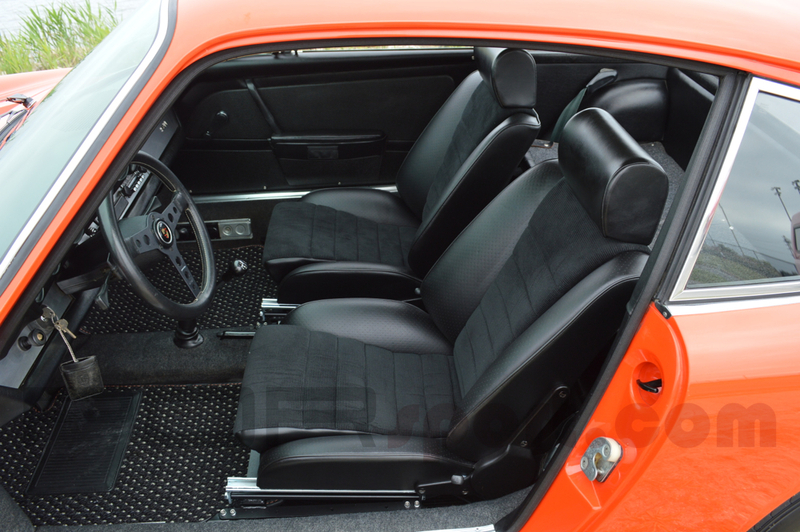 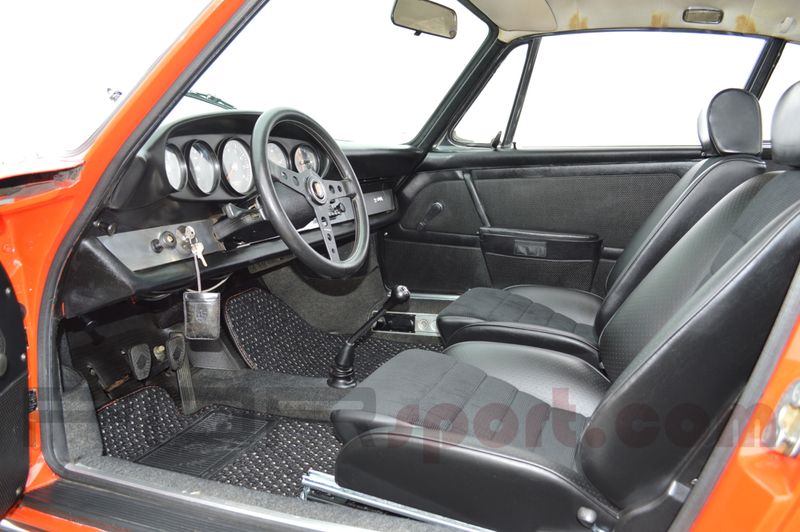 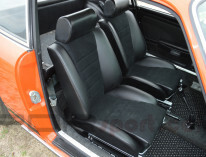 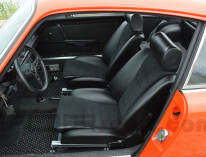 The ’68 Recaro Sport seats were rebuilt by Tony Garcia and feature corduroy centers and the original Recaro tilting frames. 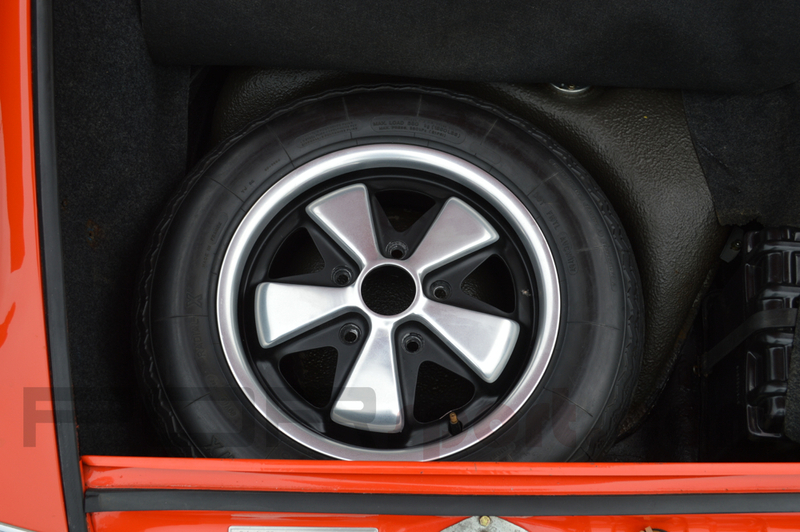 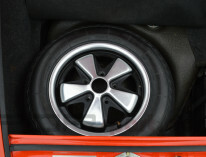 Other extras include Deep 6” Fuchs Wheels properly restored by Harvey Weidman wrapped in new Avons, Deep 6” spare with Michelin XWX tire, vintage Momo Prototipo wheel with proper horn push and original solid hub. 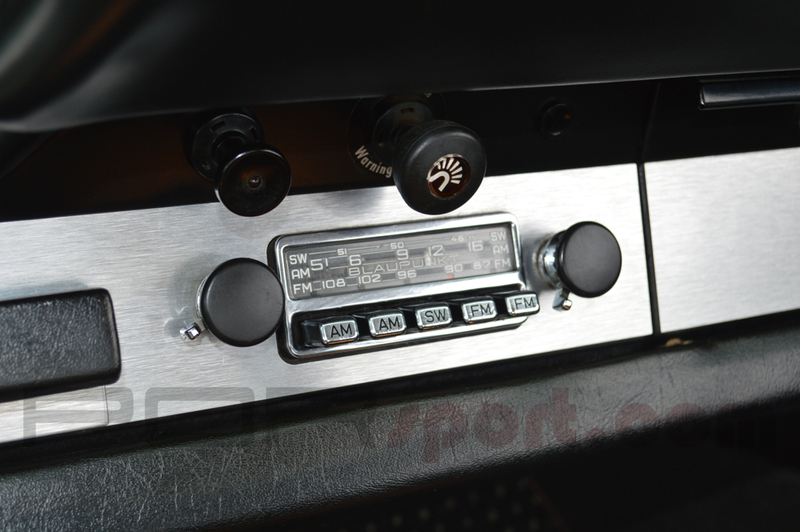 Perfect Bosch H-1 Headlight assemblies, Hella 128 fog lights, original optional Blaupunkt radio and Factory fitted Koni Sport Suspension. 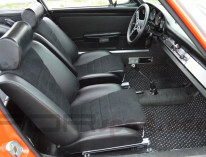 The original matching engine has been fully rebuilt and detailed, fresh brakes and full service recently completed. 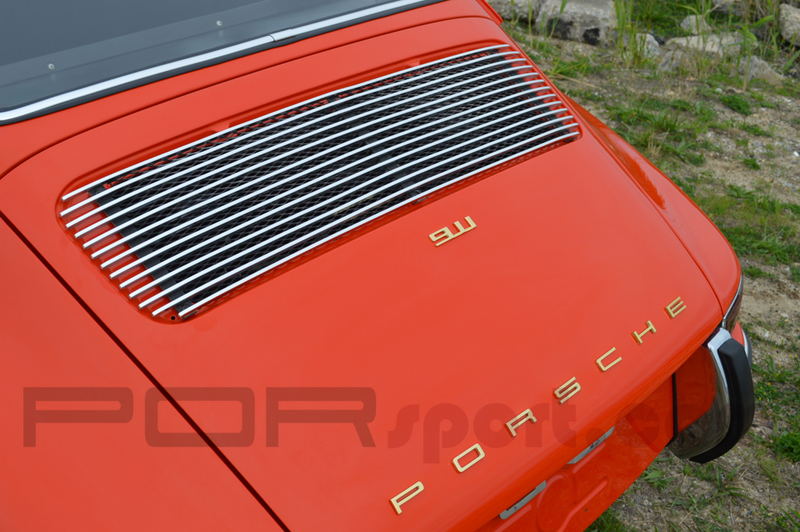 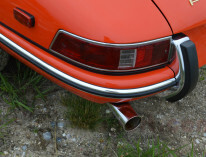 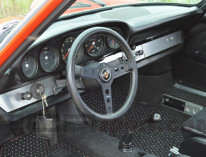 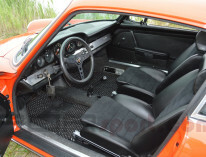 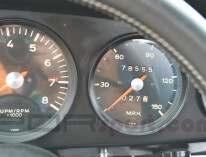 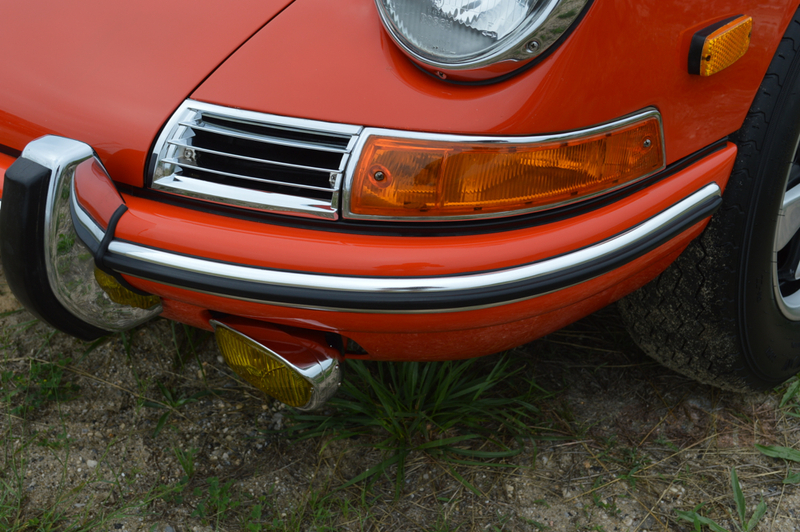 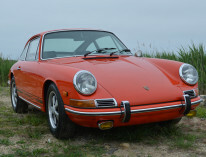 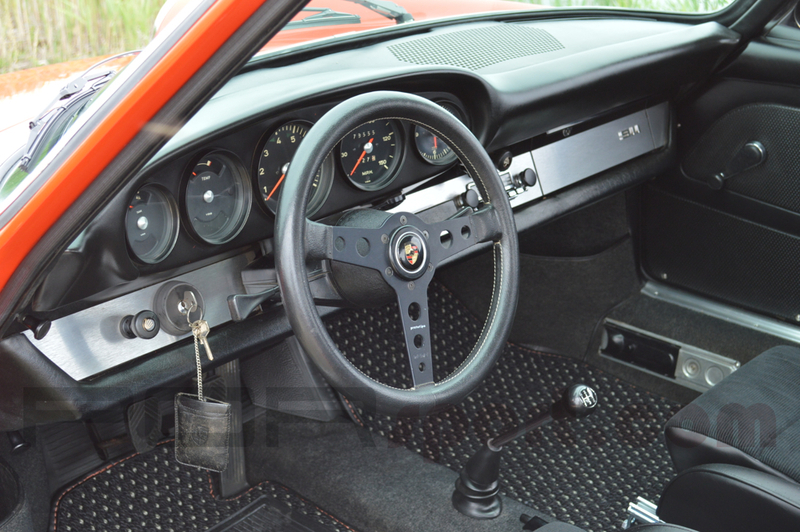 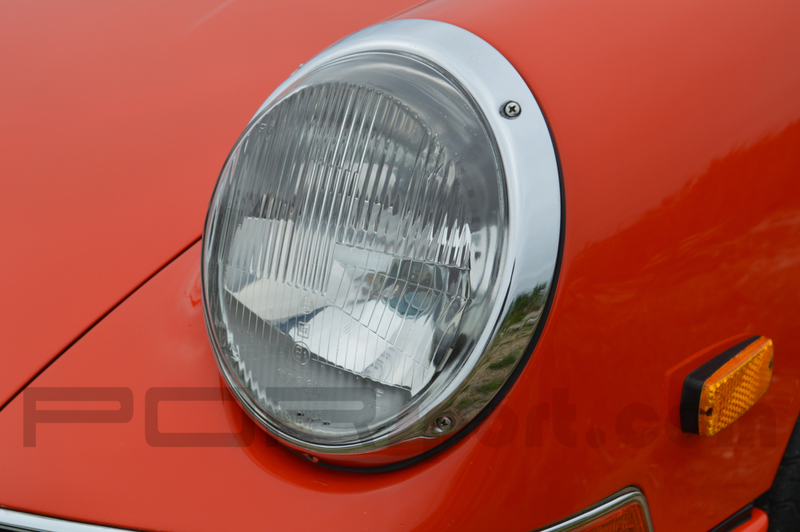 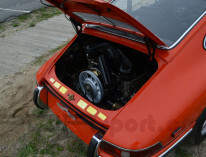 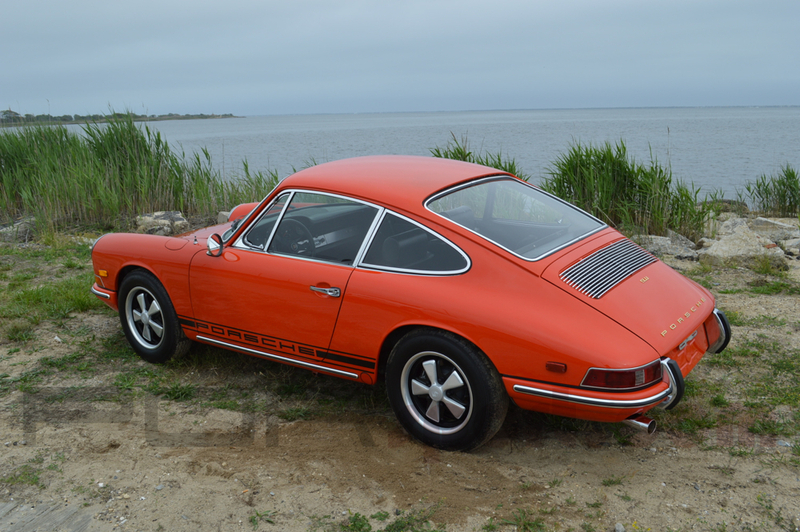 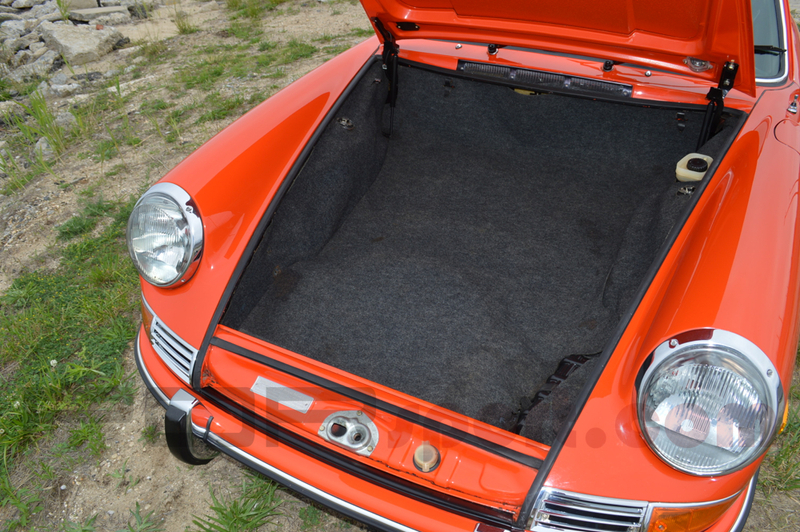 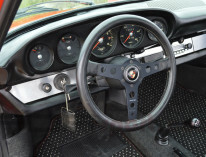 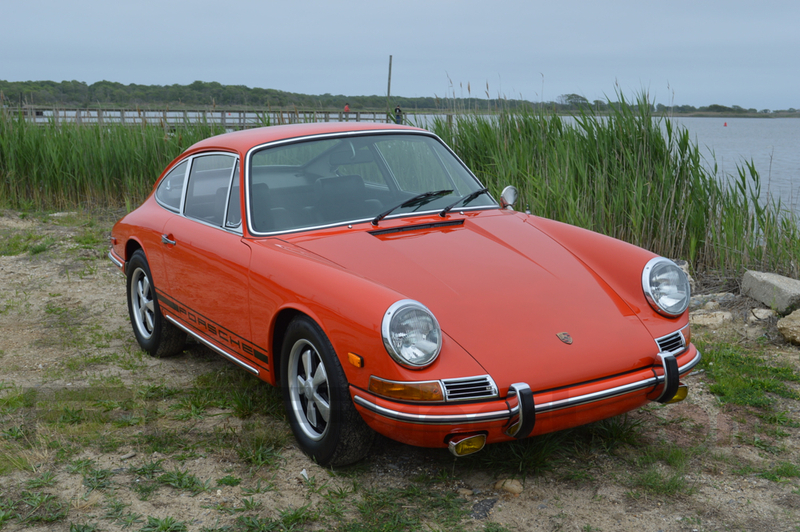 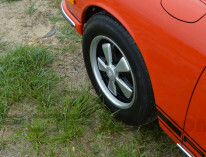 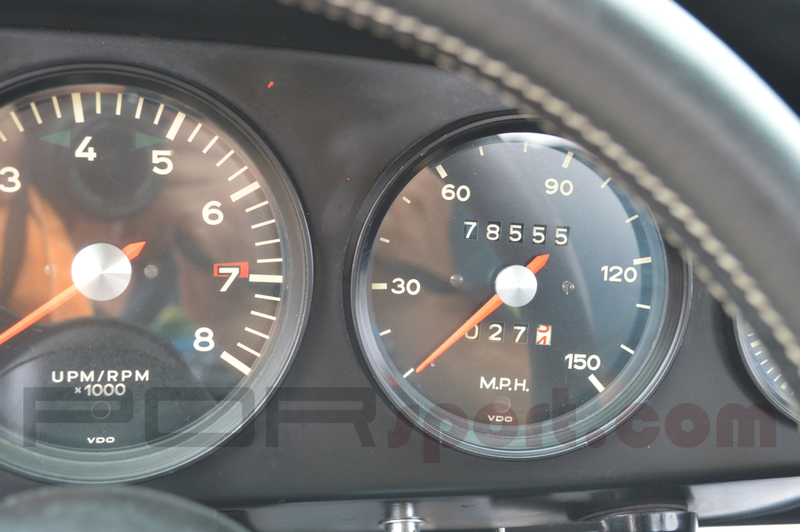 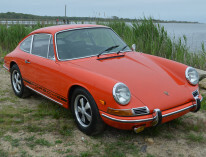 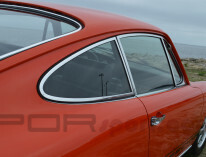 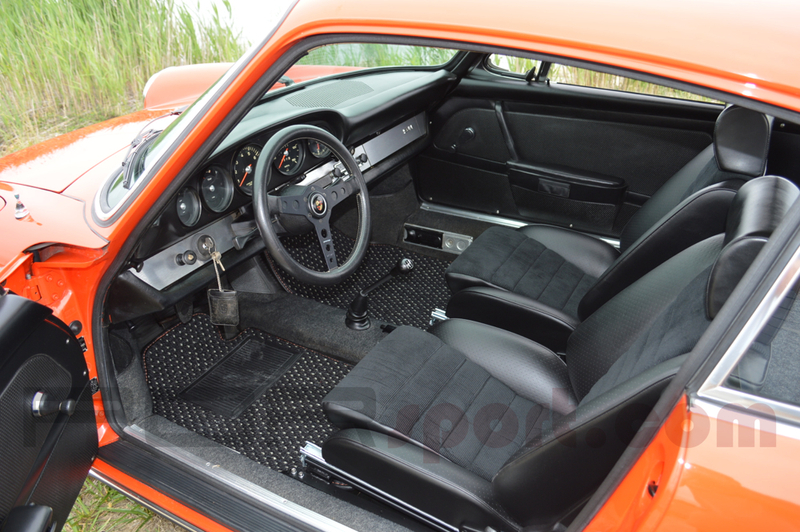 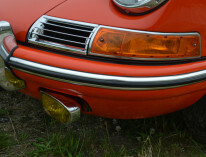 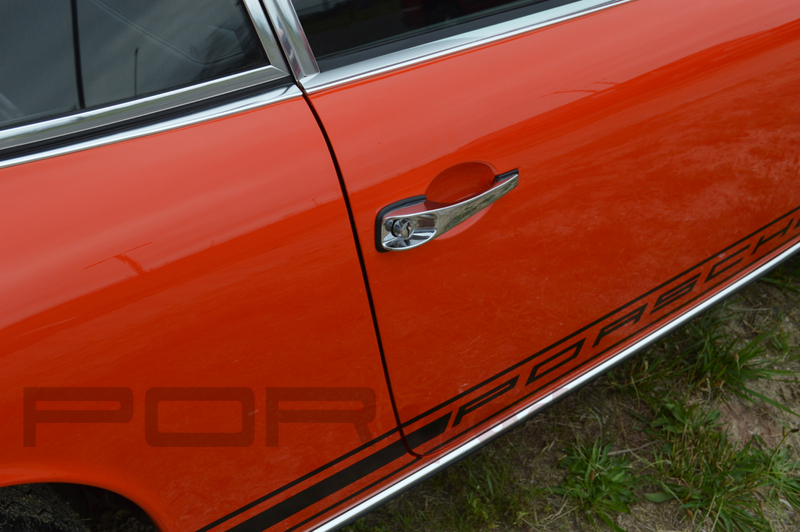 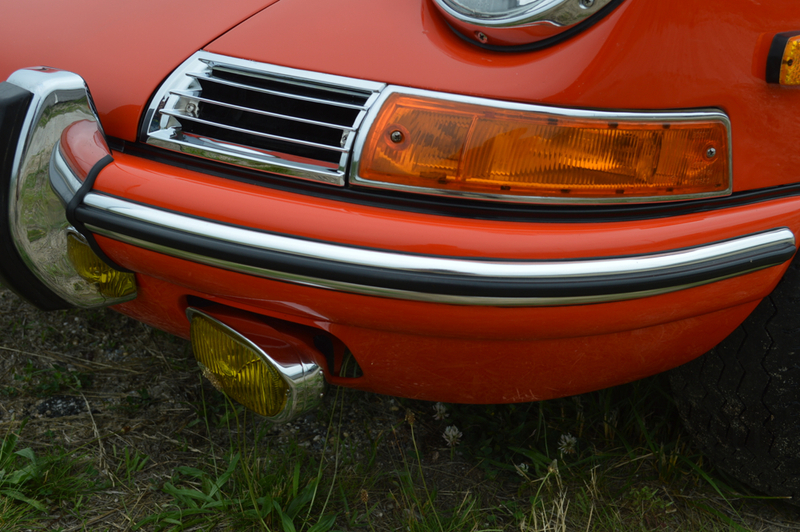 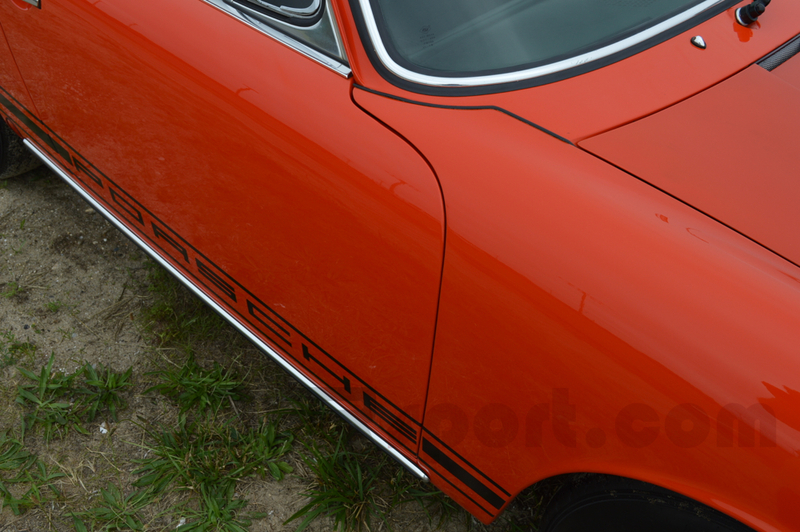 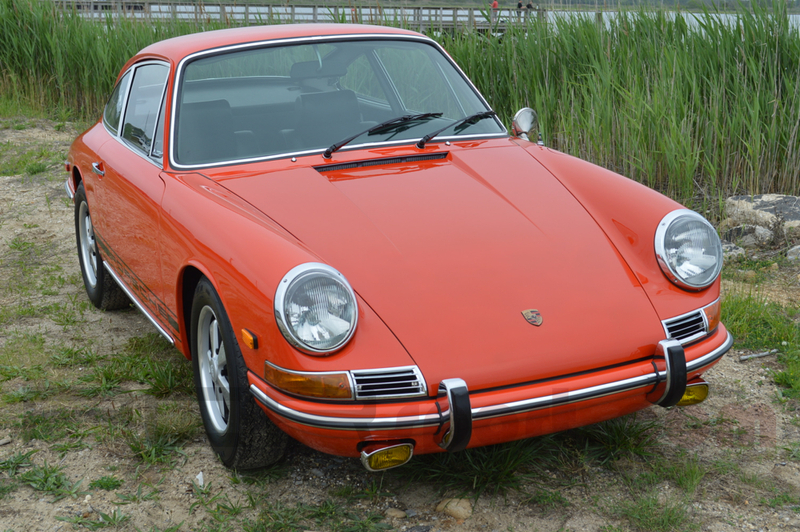 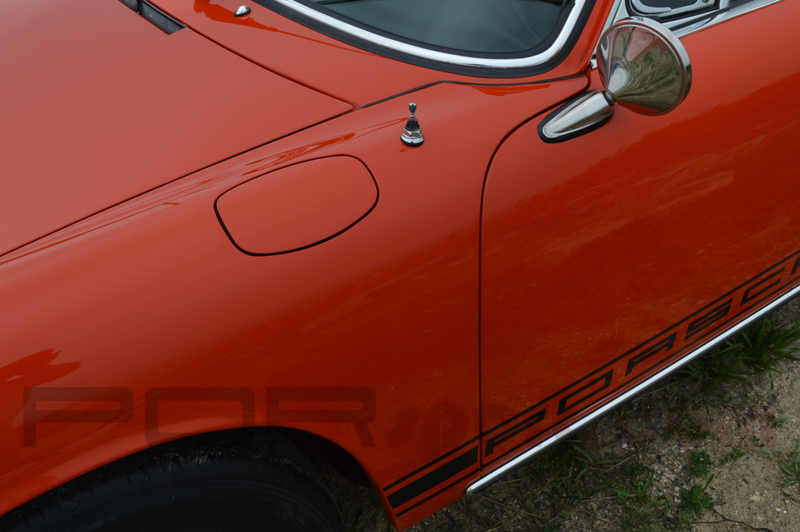 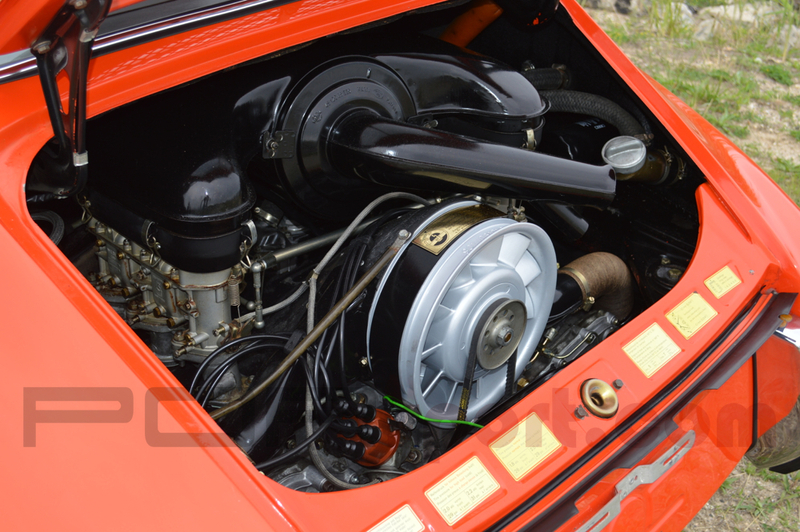 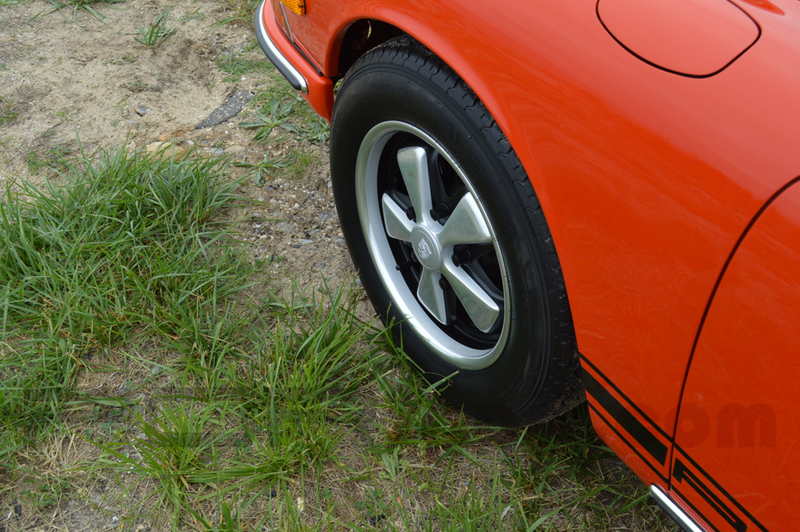 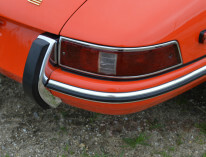 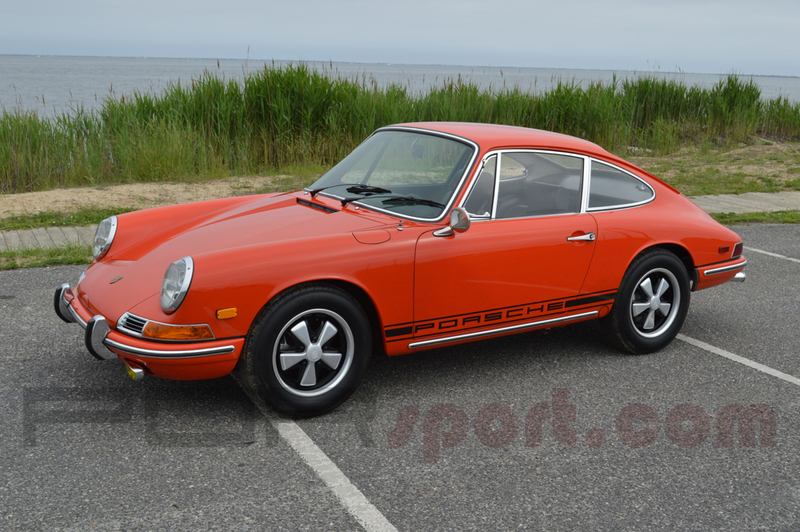 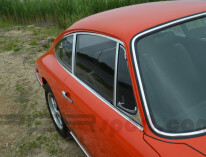 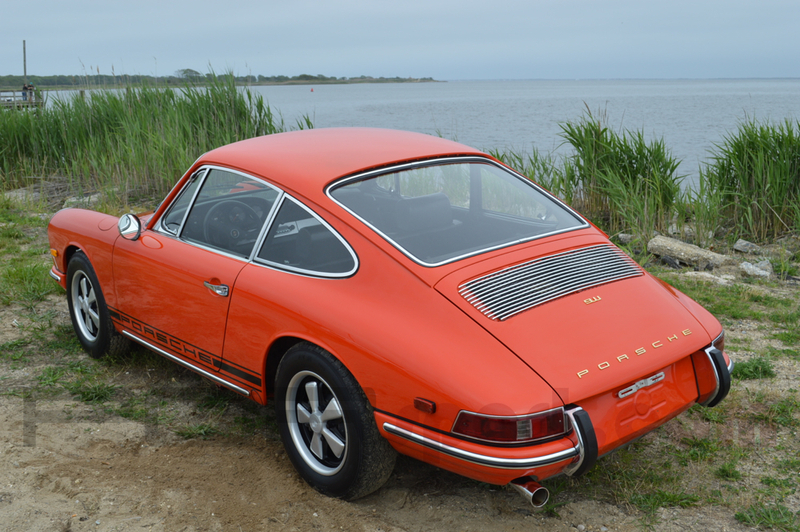 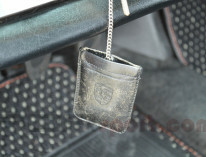 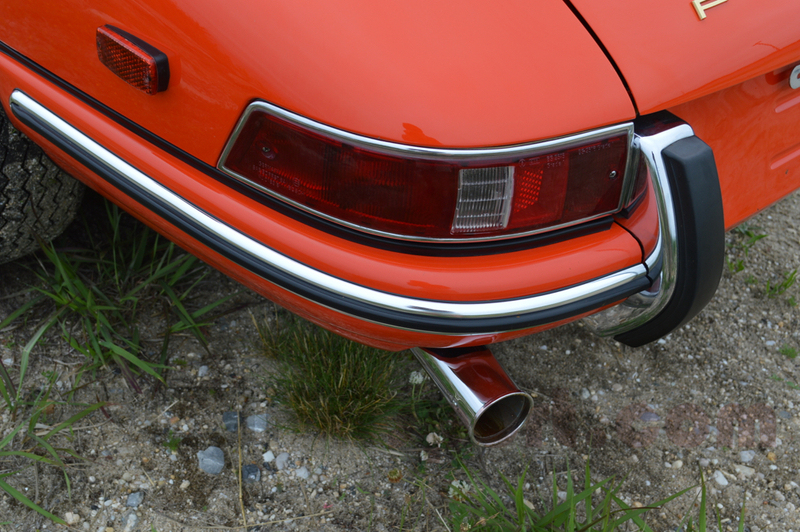 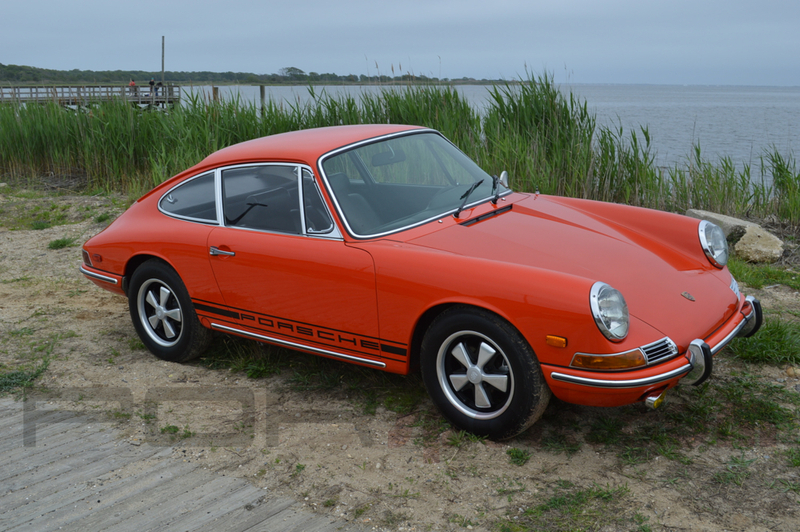 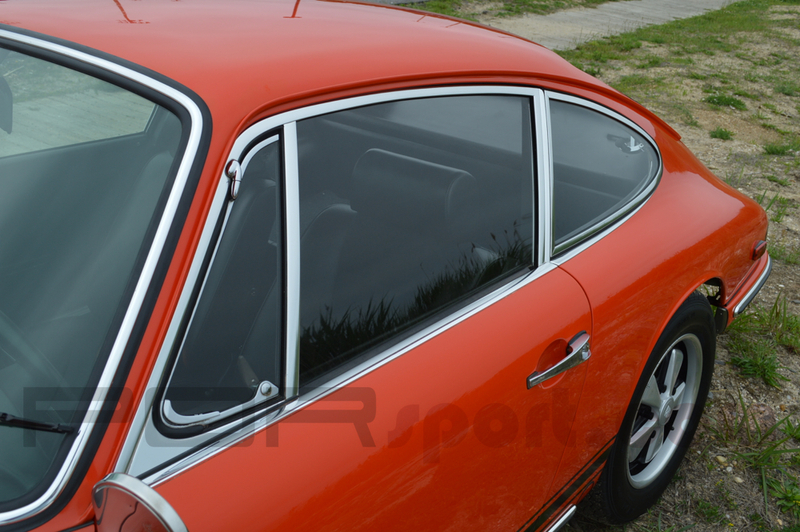 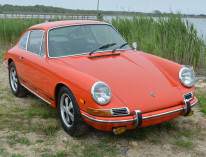 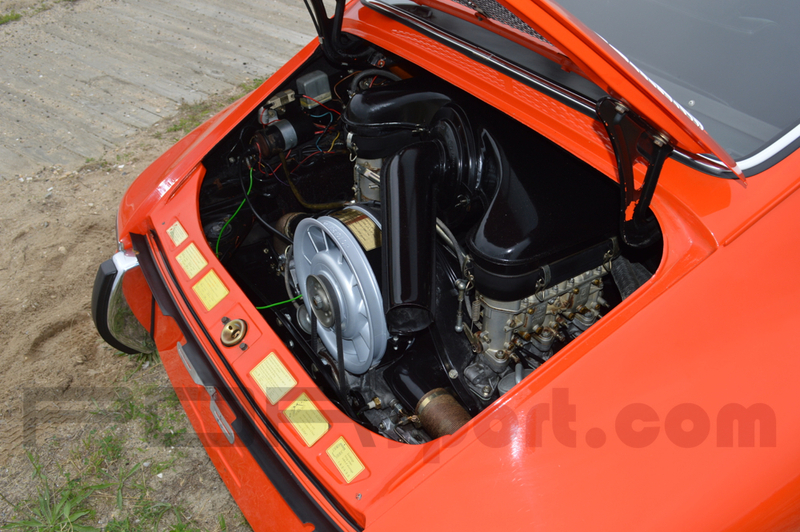 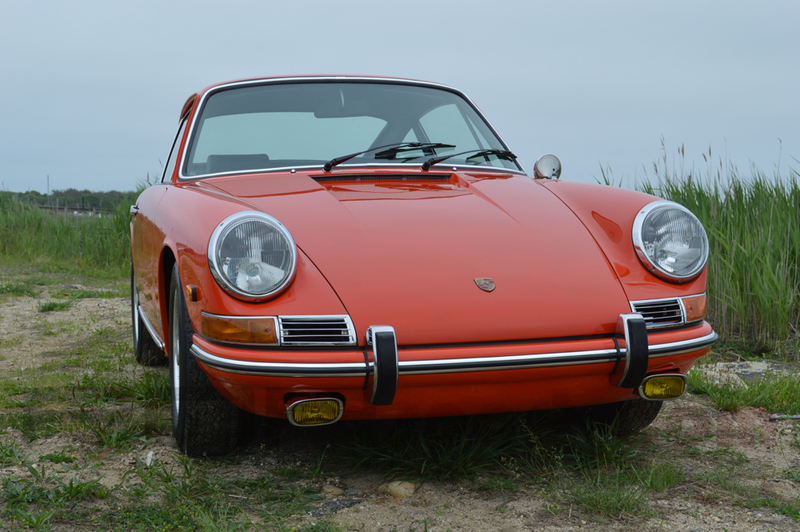 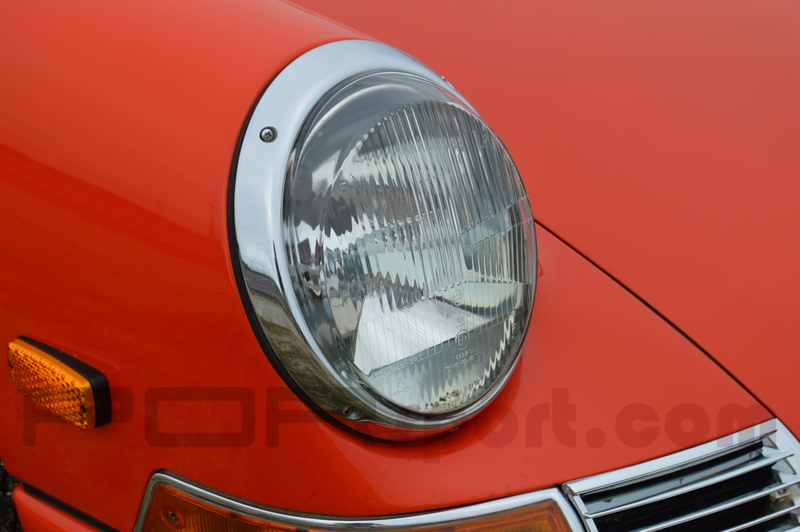 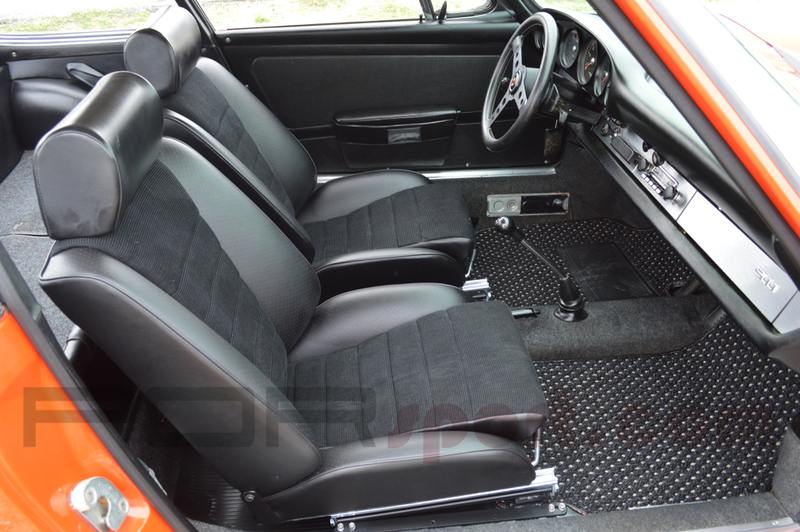 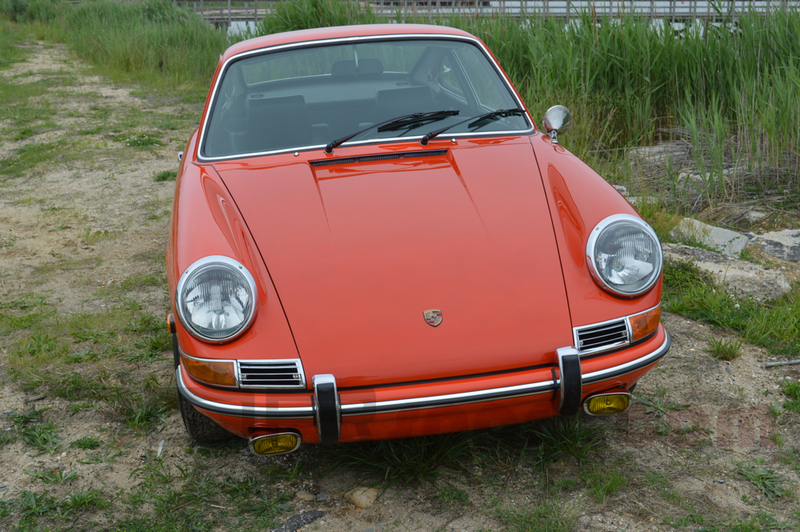 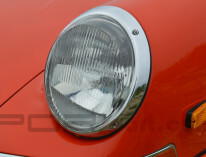 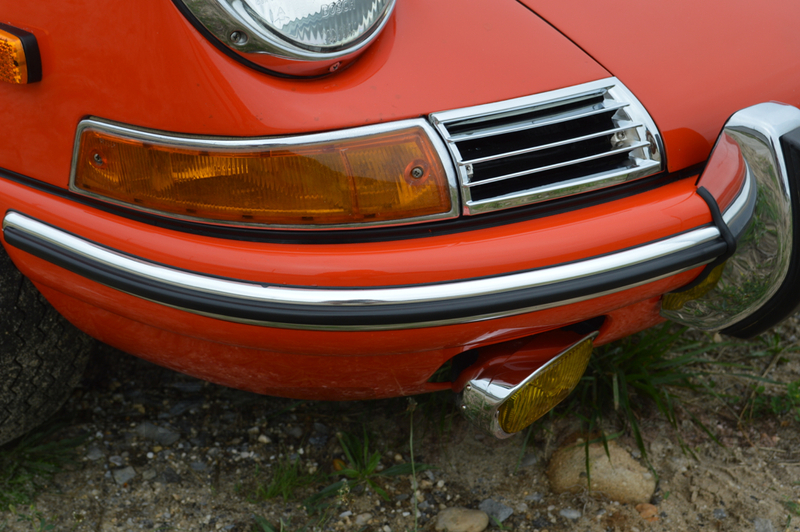 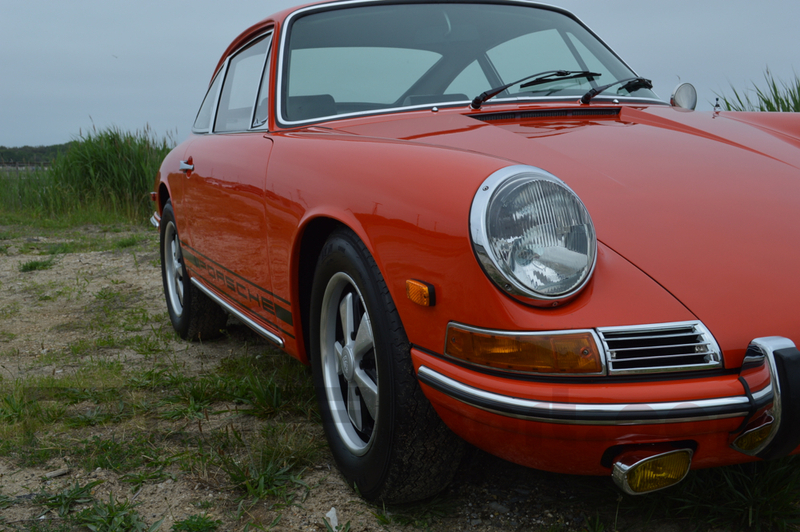 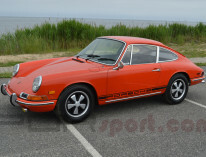 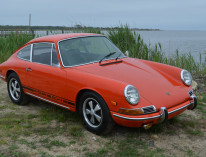 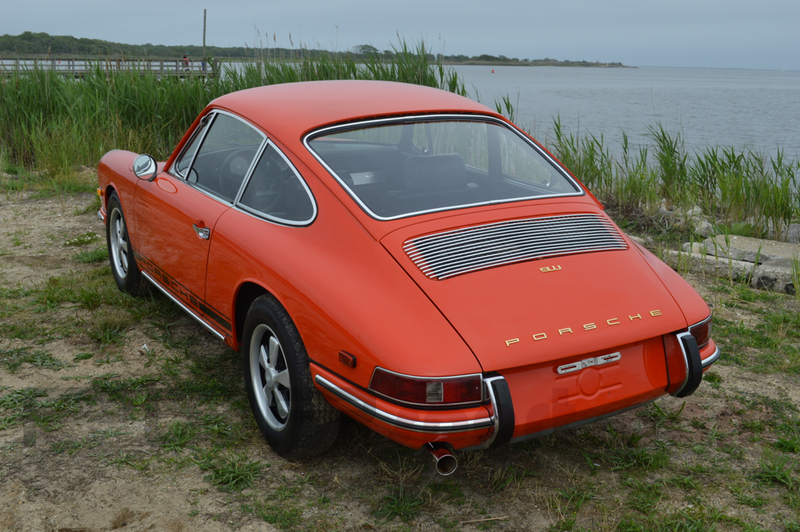 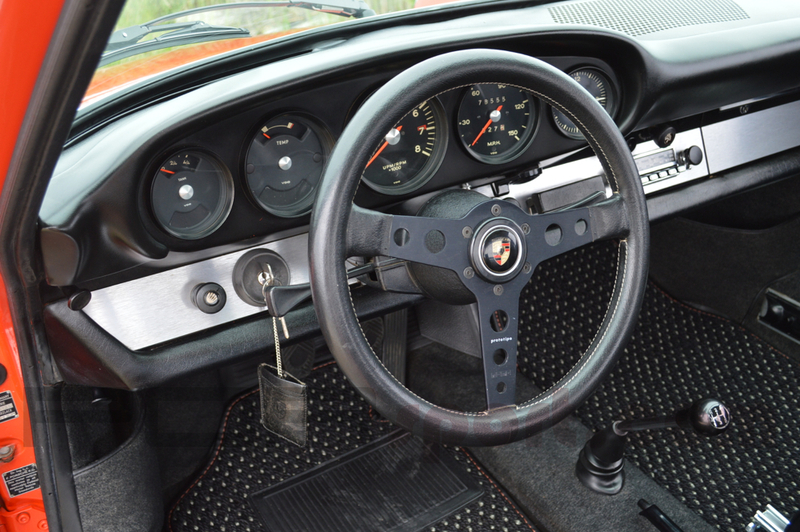 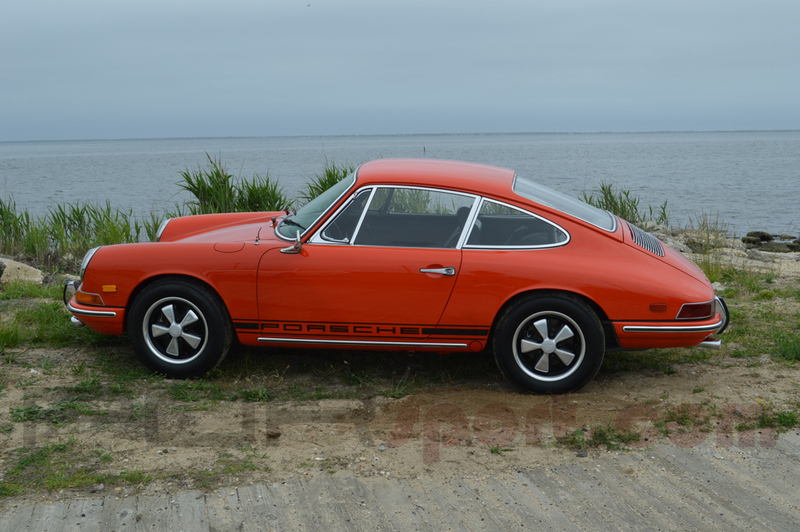 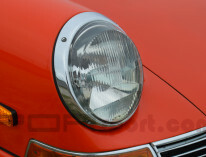 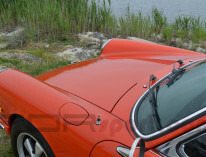 This great SWB early 911 is ready to enjoy with its “Sports Purpose” attitude it would make for a great event car.